It’s rare that I post a recipe from a magazine. I don’t know why I don’t do it more often, because I honestly find the recipes in Canadian Living to be extraordinary. Not only are they beautifully photographed, but they are often very intriguing! 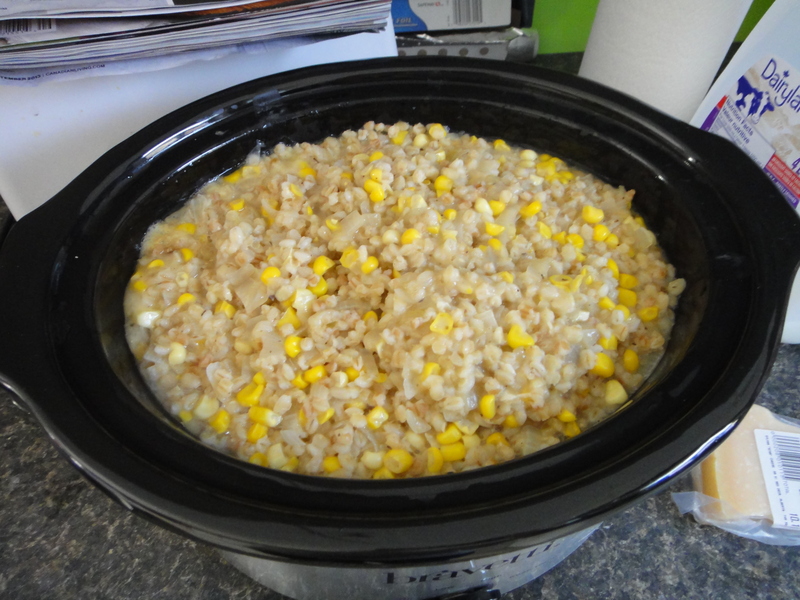 Last month’s Canadian Living inspired me the make a sweet corn and barley risotto that was a huge success! 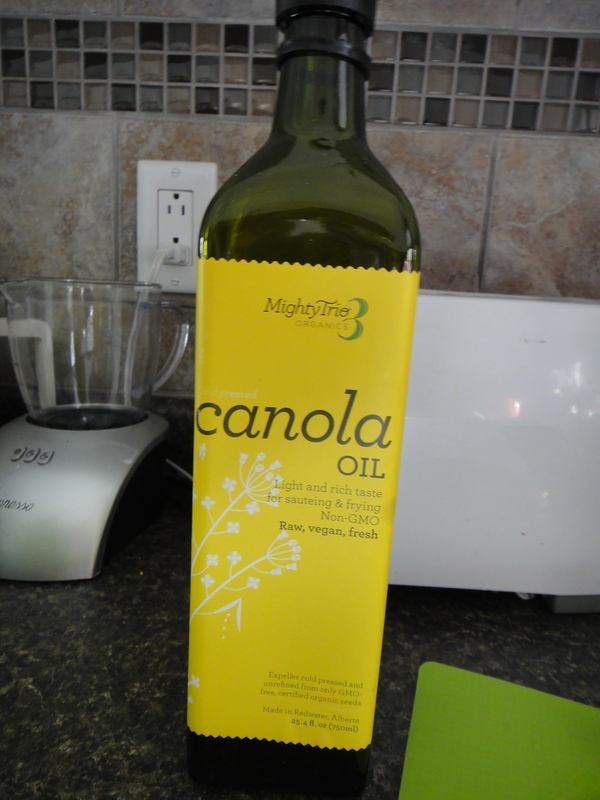 While the recipe didn’t call for wine, I thought it would make for a delicious added touch. 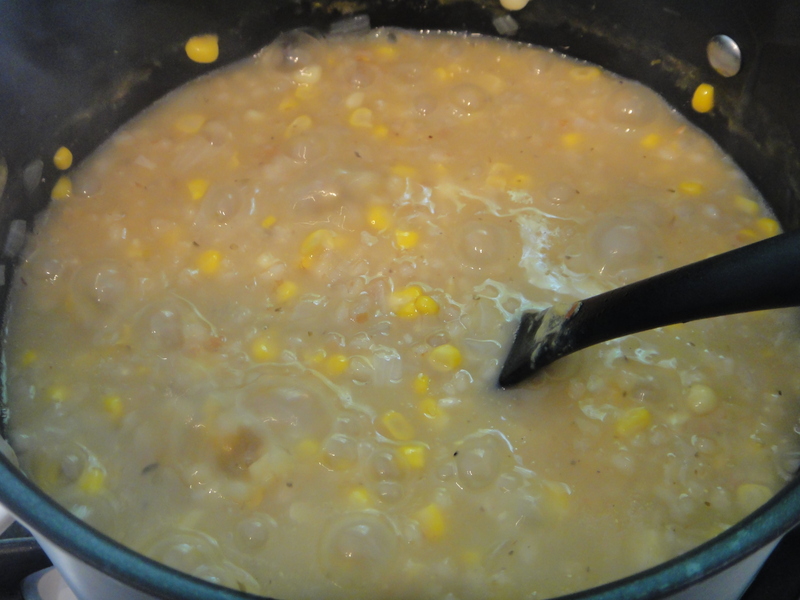 I used fresh Taber corn for this recipe. 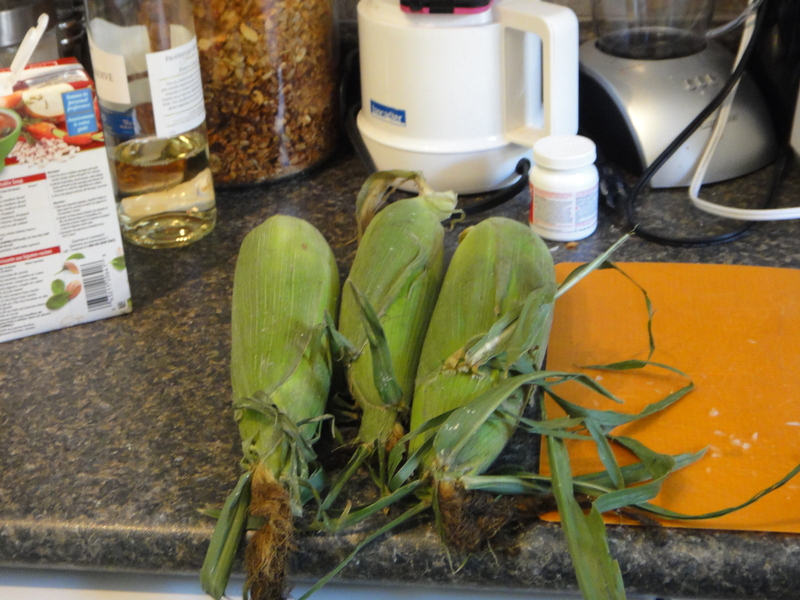 Nothing says late summer like sweet Taber corn. 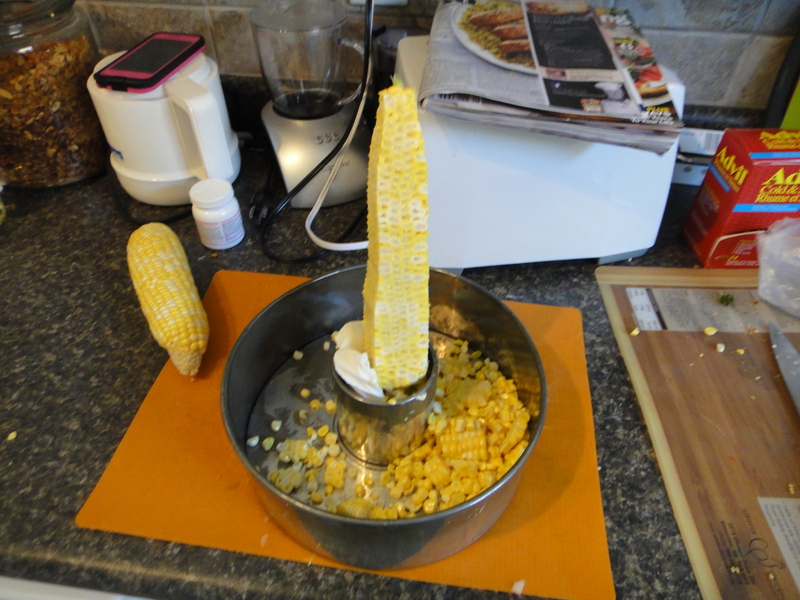 The guy at the corn booth gave me a great idea to get the kernels off of the cob more easily. Stick it in an angle food cake pan and slice away! Tada! It worked like a charm! 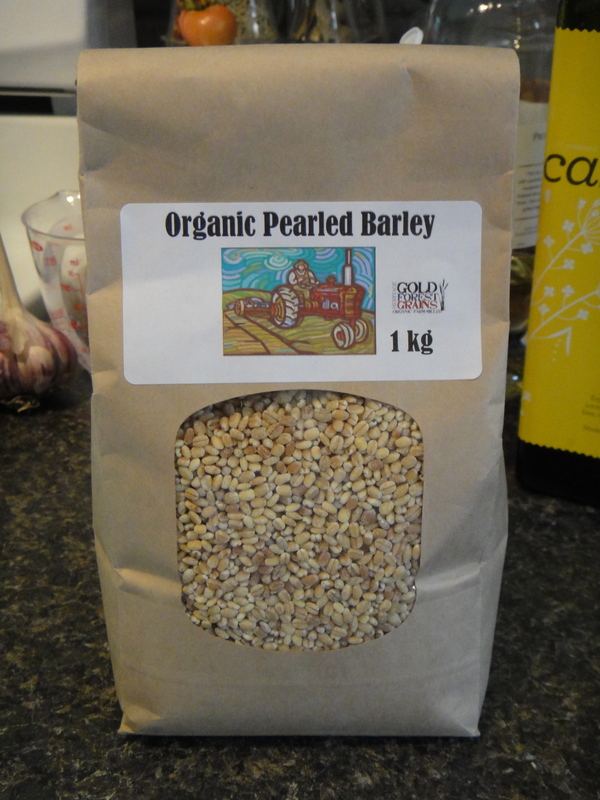 Of course, I used Organic Pearled Barley from Gold Forest Grains. 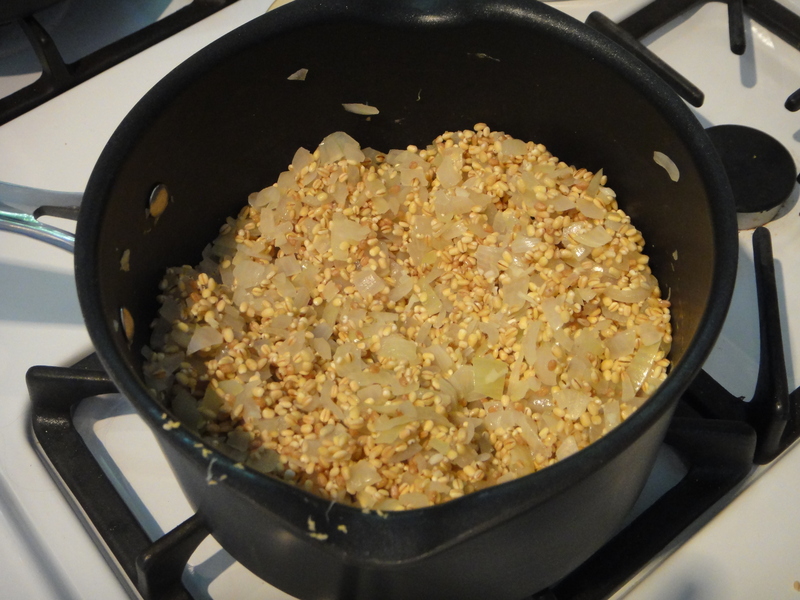 The first step was to brown some onions and add the barley to the pot, to get it to toast a little before adding moisture. 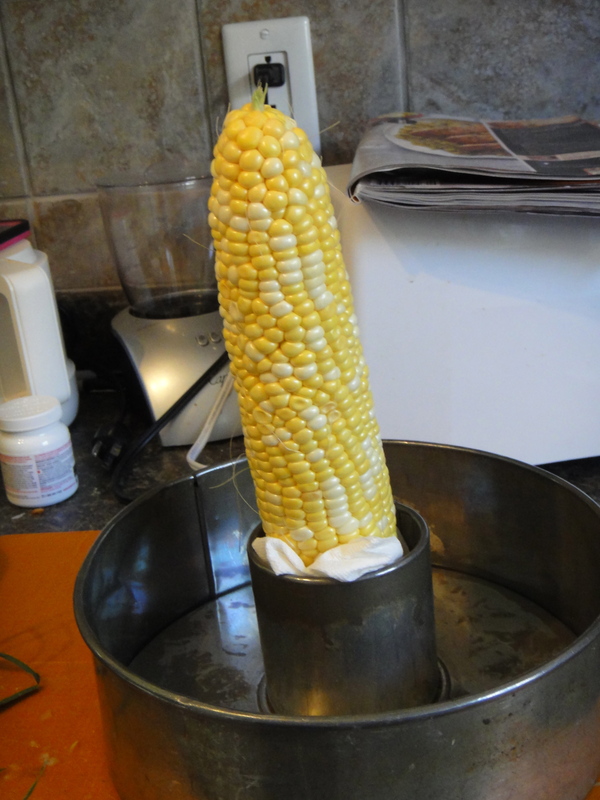 I used a lot of corn for this recipe. 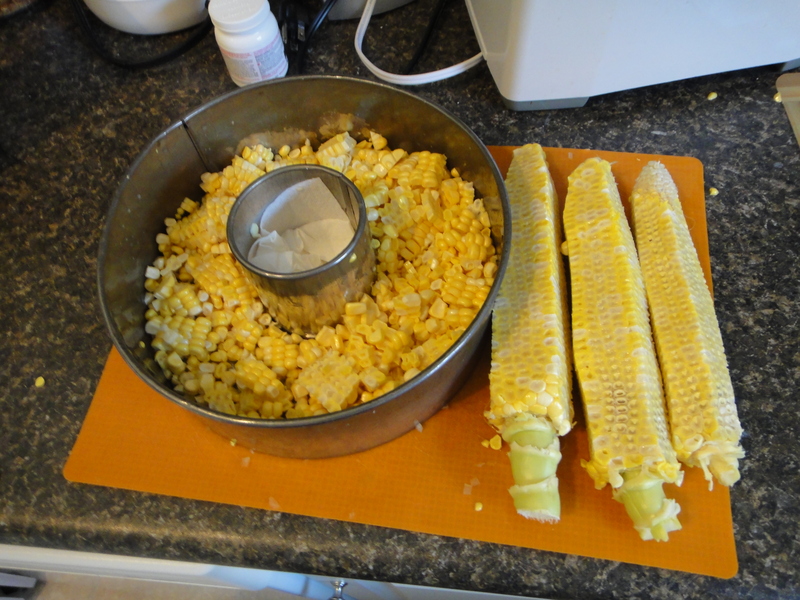 I LOVE Taber corn! 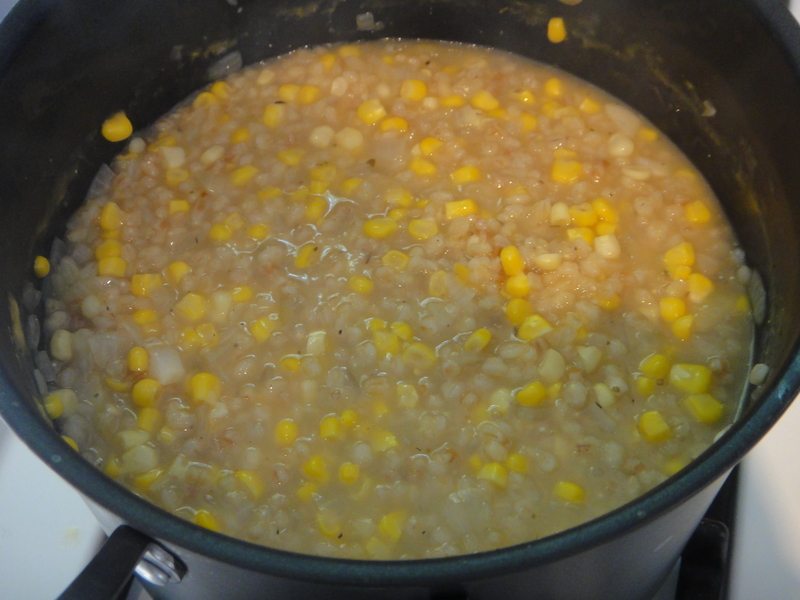 Next, I mixed the corn in with the barley and onions. 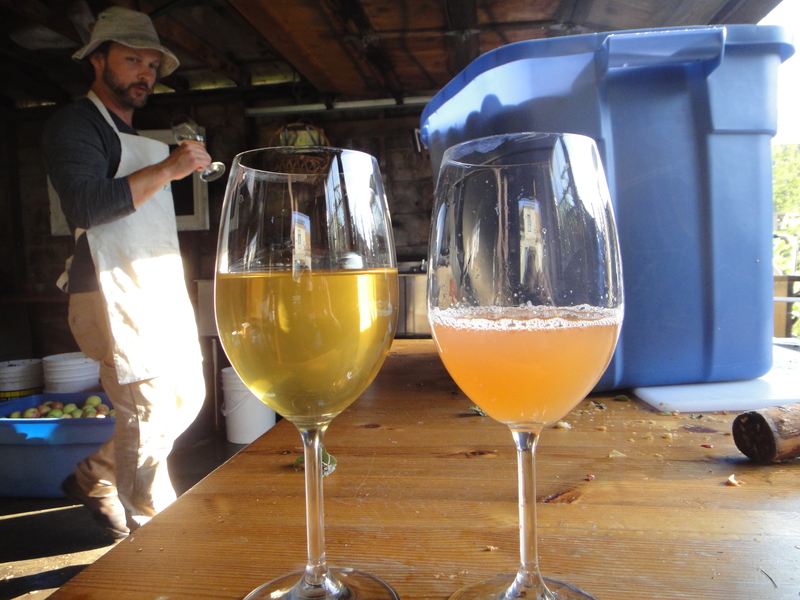 While the barley was toasting, I put the wine and broth on the stove and heat until steaming. 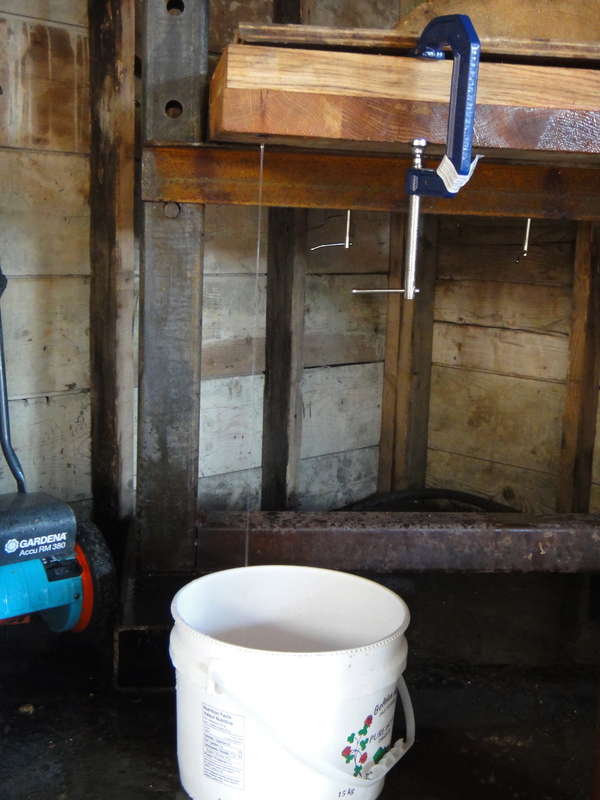 Then I transferred the barley mixture to the liquid. Now, this is where your patience comes in. You have to let it bubble and boil for for about 45 mins. 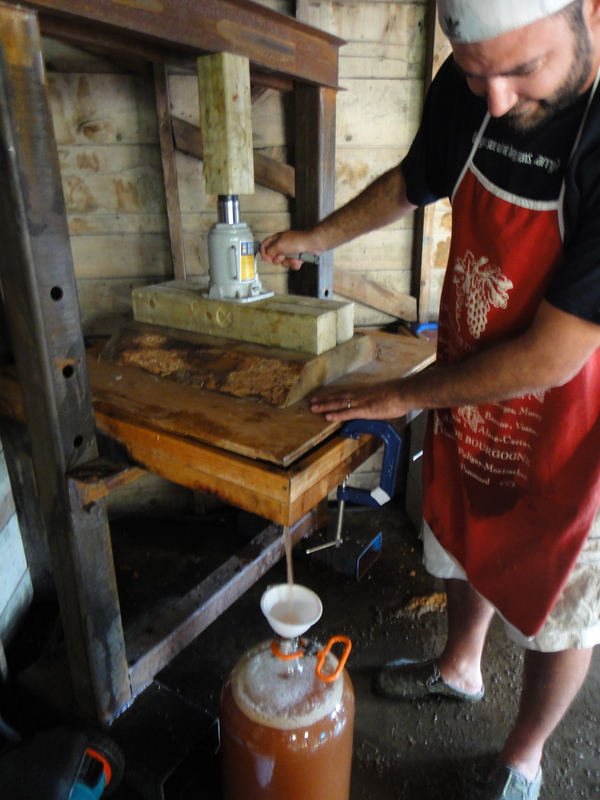 When most of the liquid is absorbed, and the barley is fully cooked, you’re good to go! Next step is to add the cheese. 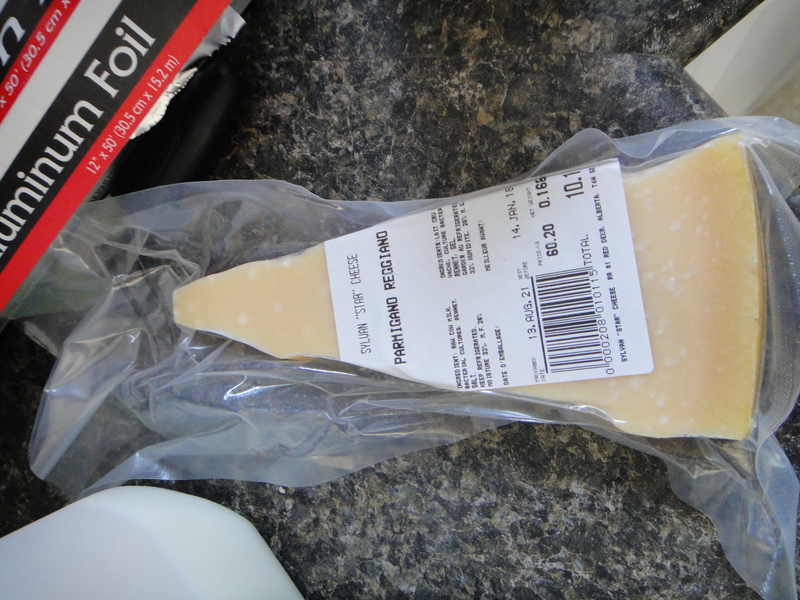 I used a whole piece of Parmesan from Sylvan Star for this recipe. It added so much to the flavour! I also added some fresh garden chives to the mix. 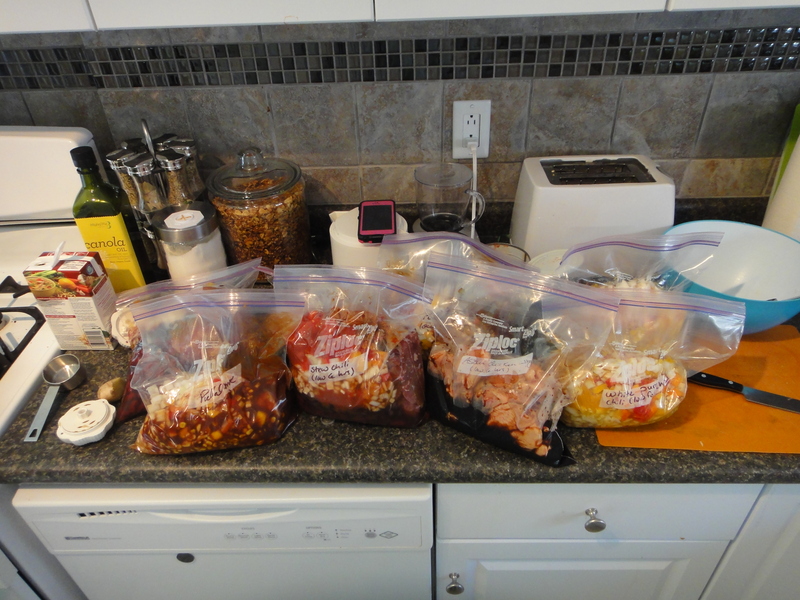 I transferred the whole lot to the crockpot to keep it warm, as I was bringing it to a potluck that evening. 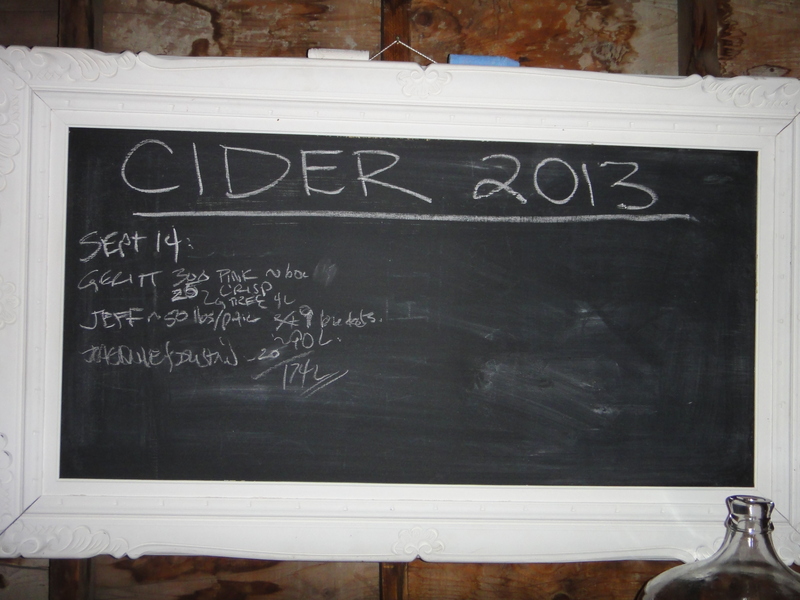 It made for a great addition to a fantastic evening of cider pressing. 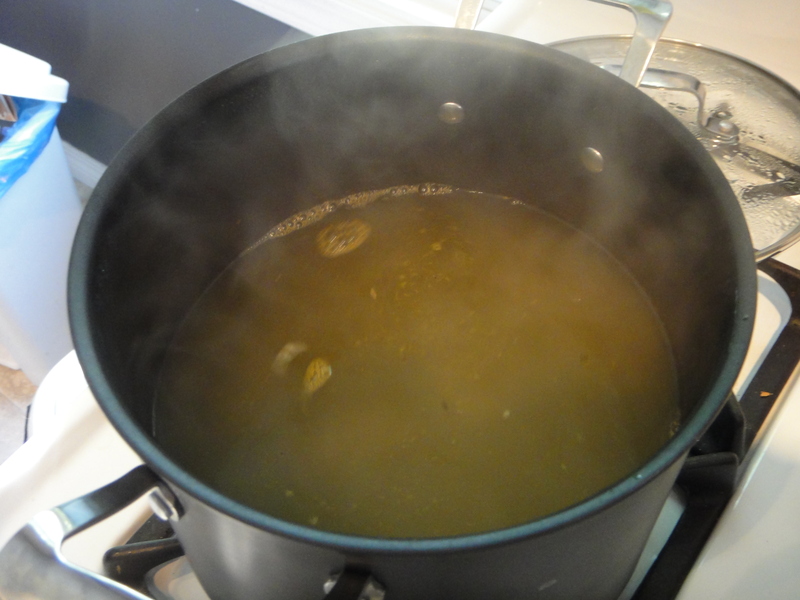 In a saucepan, bring broth and wine to a simmer, keep warm. Meanwhile, in another pot, brown onion and garlic until soft. Add barley, cook, stirring to coat. 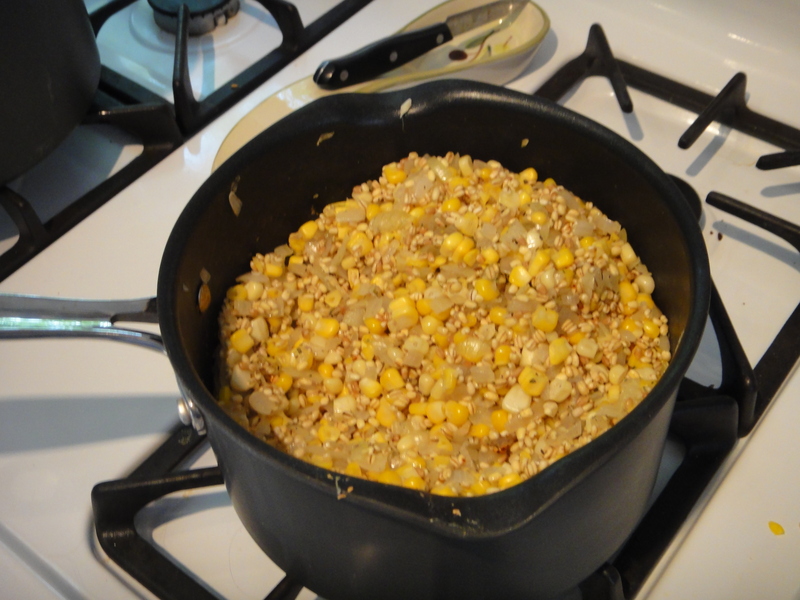 Mix in corn. 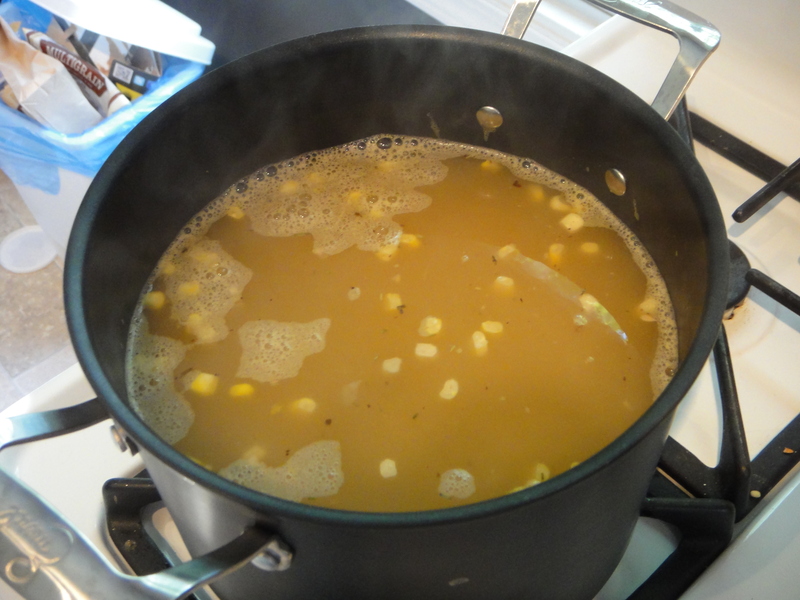 Add broth and wine mixture to barley mixture, stirring occasionally, until barley is creamy and cooked, for about 45 mins. Stir in Parmesan, and enjoy! Ah, fall. ‘Tis the time for leaves crunching underfoot, warm harvest soups and stews in your crockpot, and the time to pick apples. 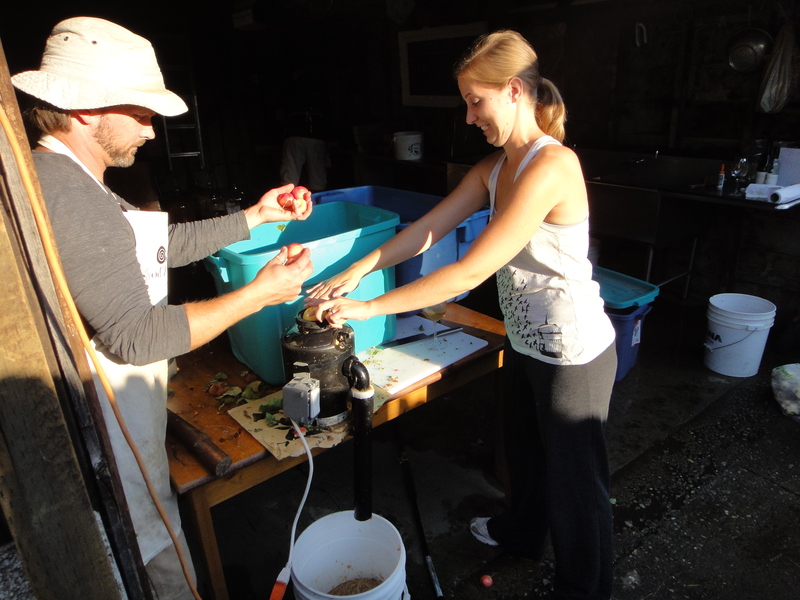 For the past 3 years, Justin and I have been members of Operation Fruit Rescue Edmonton (OFRE). This wonderful organization strives to find the fruit hidden in our city. As a Fruit Captain, I organize fruit picks in Edmontonians’ yards. This fruit, that otherwise would have gone to waste, is divided between the volunteer fruit pickers, OFRE, and a local charity. It’s a great way to save fresh local organic fruit from ending up in the landfill, plus, you get to go home with a plethora of free fruit! 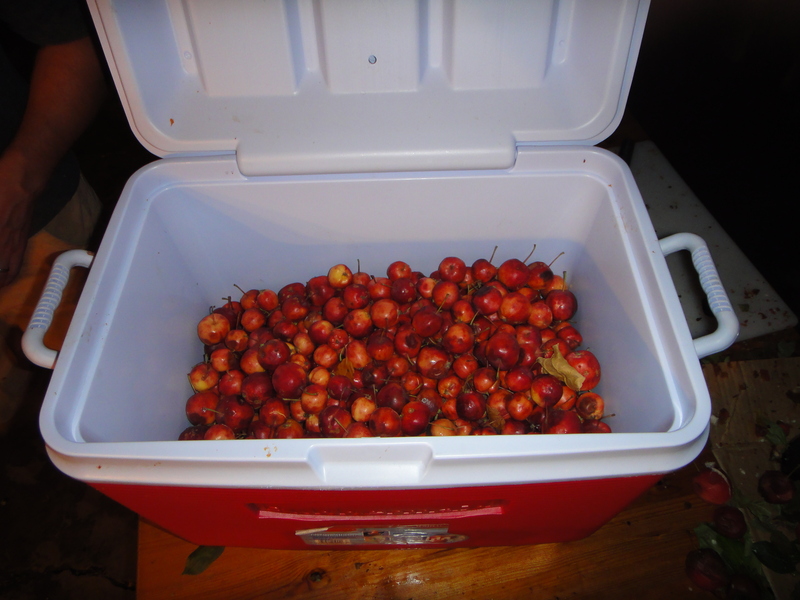 This year, Justin and I opted to picked as many apples as we could. 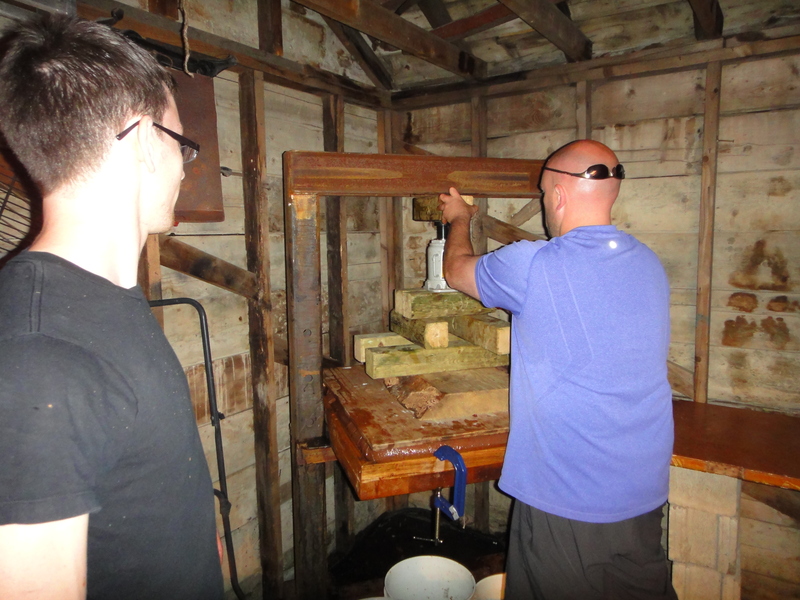 Last week, we were extremely fortunate to be invited to Kevin Kossowan‘s to partake in a fantastic evening filled with great company, amazing food, and (the crowning glory) apple juicing. 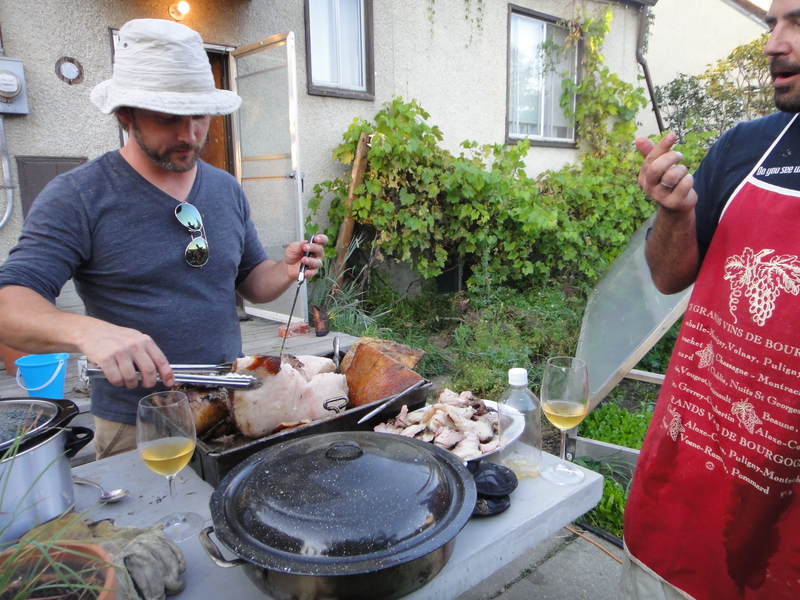 Some of you may know Kevin as the co-founder and owner Lactuca, as the Canadian Prairie’s Slow Food Hero, or as the co-owner and operator of Shovel and Fork. 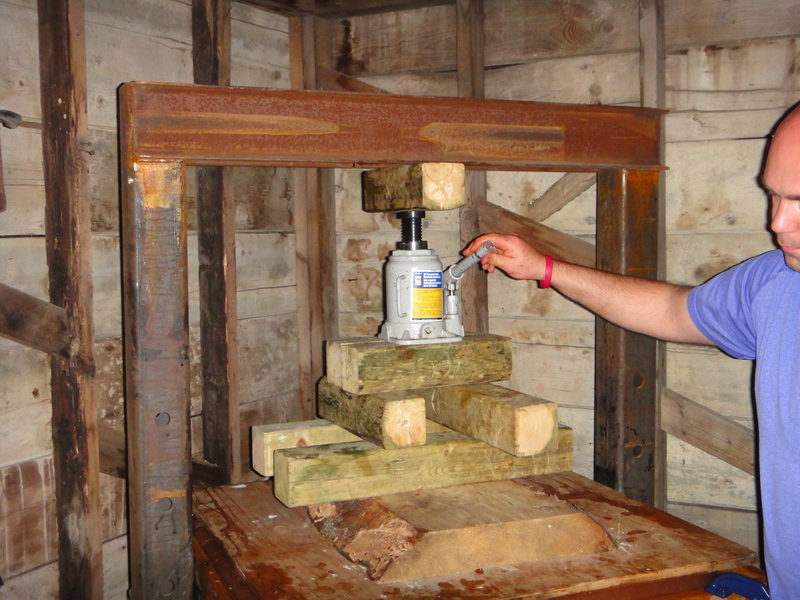 All around, he is extremely passionate about local food, making it his life’s work. 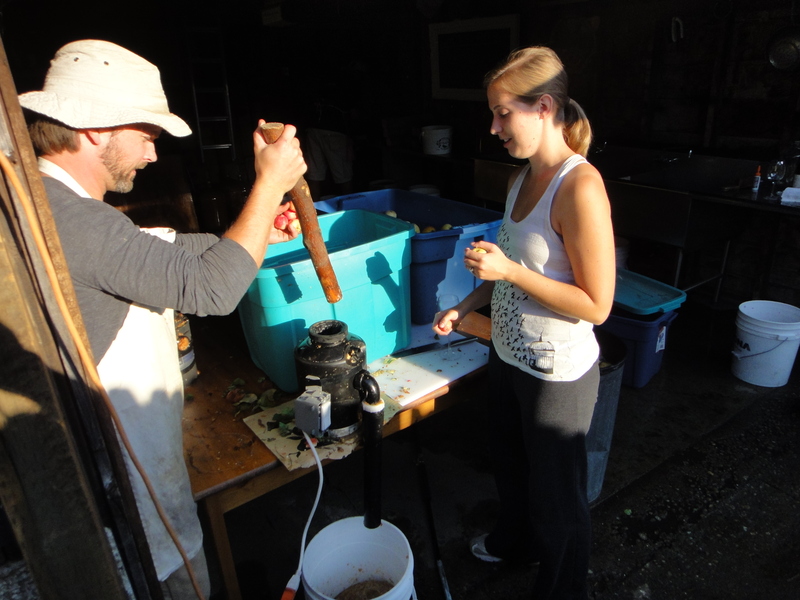 We could not have been more excited to be invited to use his famous juicer. Upon entering Kevin’s yard, we were blown away at his efficient use of space. 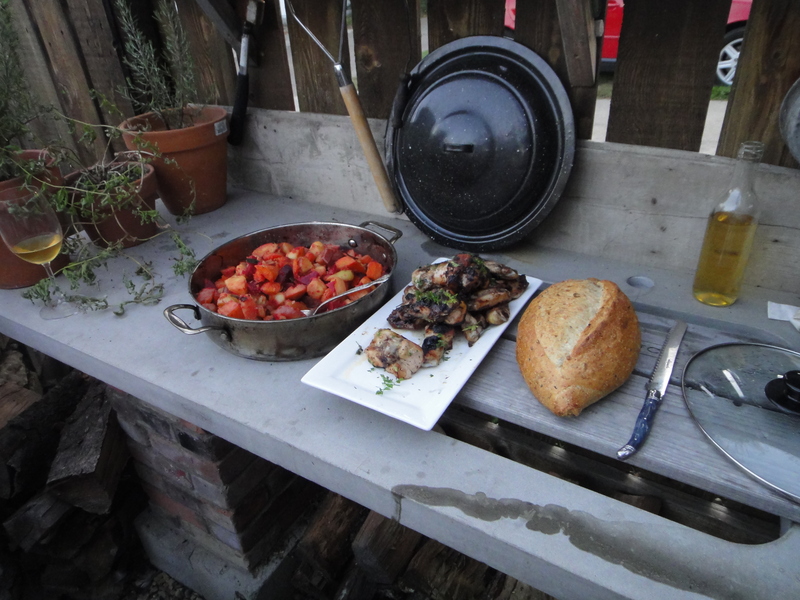 It seemed as if every square inch of the backyard was being used to grow food. 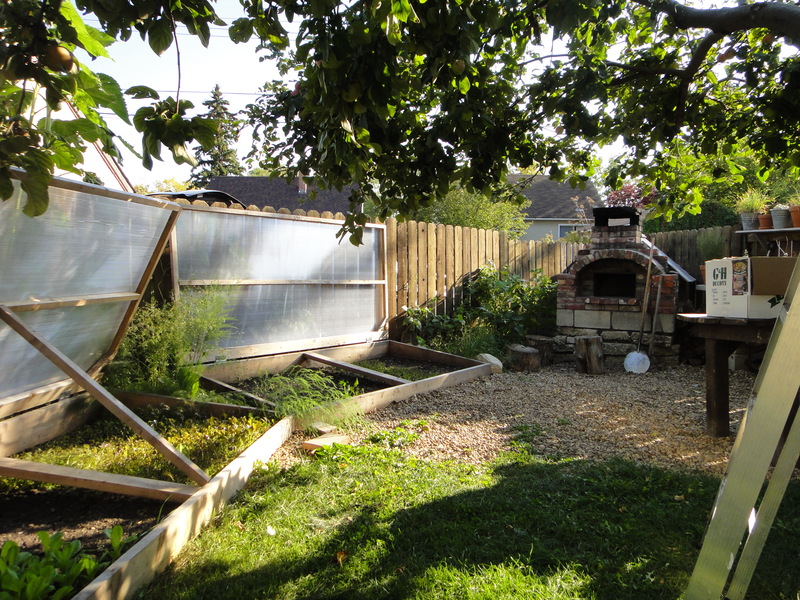 Here are his famous cold frames, and his cob oven. 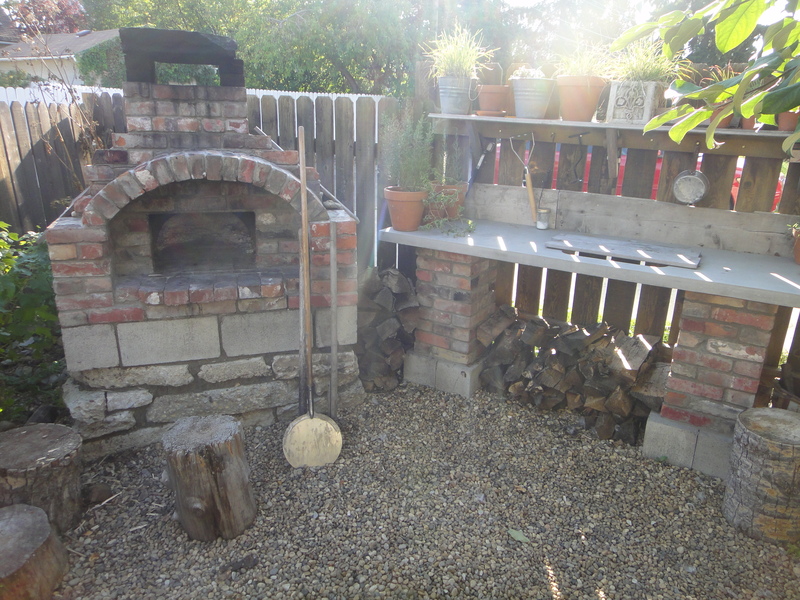 The cob oven has its own story. I encourage you to watch it. 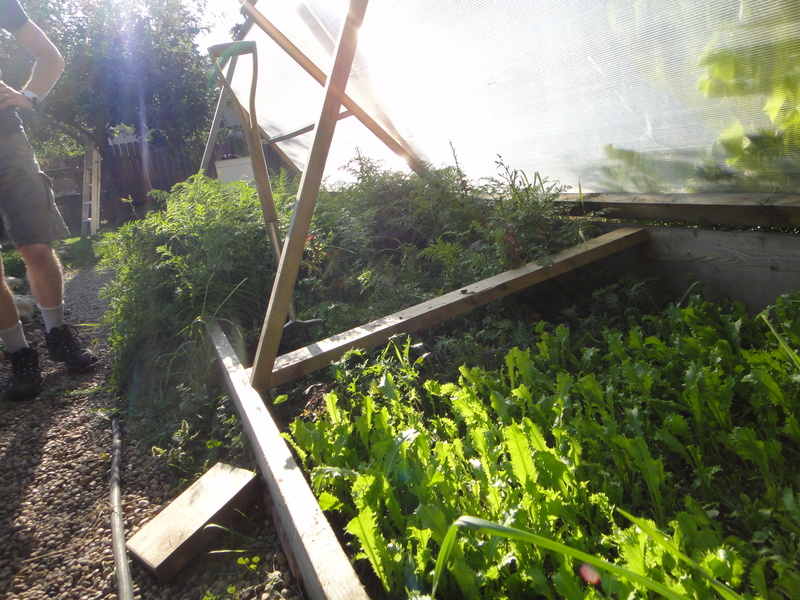 The cold frames help supply greens for Lactuca, one of his businesses. Here’s an example of how Kevin has managed to efficiently use every single inch of his yard for food production. 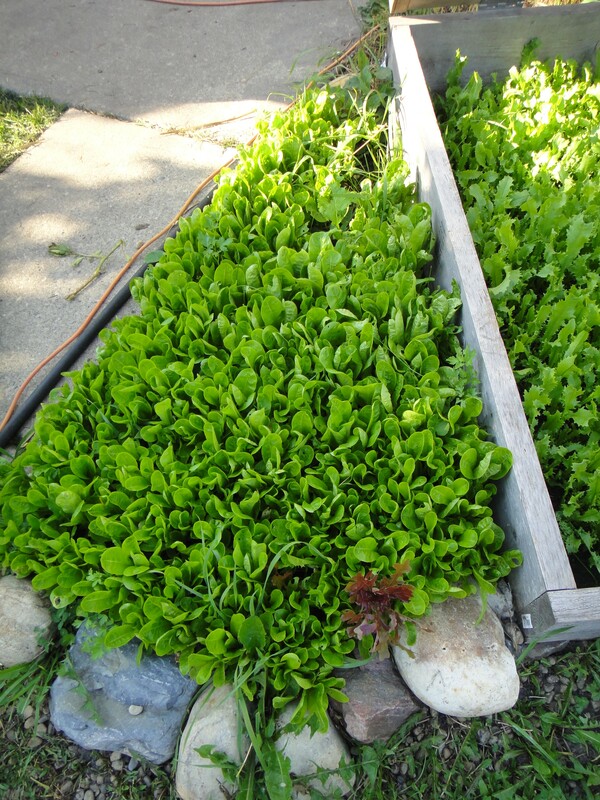 This tiny triangle of greenery is wedged between a cold frame and a walking path. This is pure genius! It inspired Justin and I to do some future crafty landscaping in our yard. 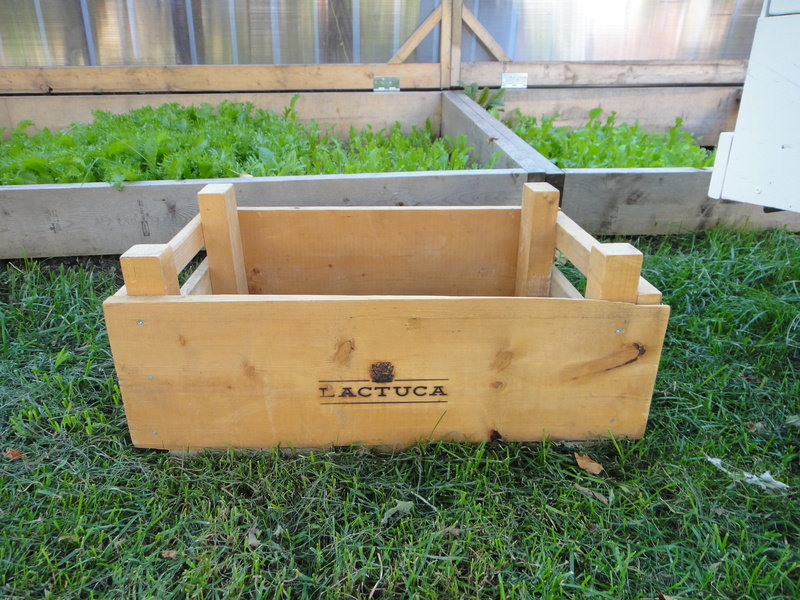 These cold frames extend Kevin growing season from April to November. In Edmonton, that is virtually unheard of! Ok now on to the juicing. 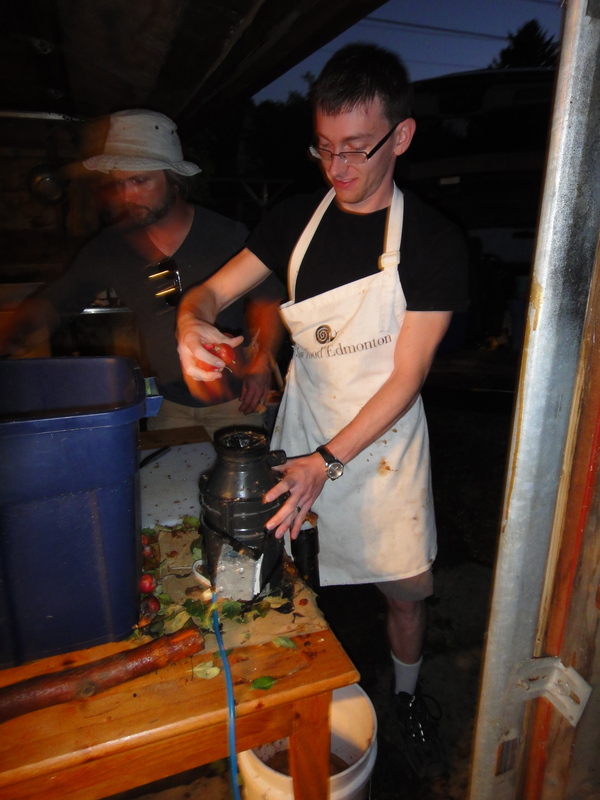 This was the first day of many that Kevin would be juicing for 2013. He writes down the date and how many liters he juiced that day. 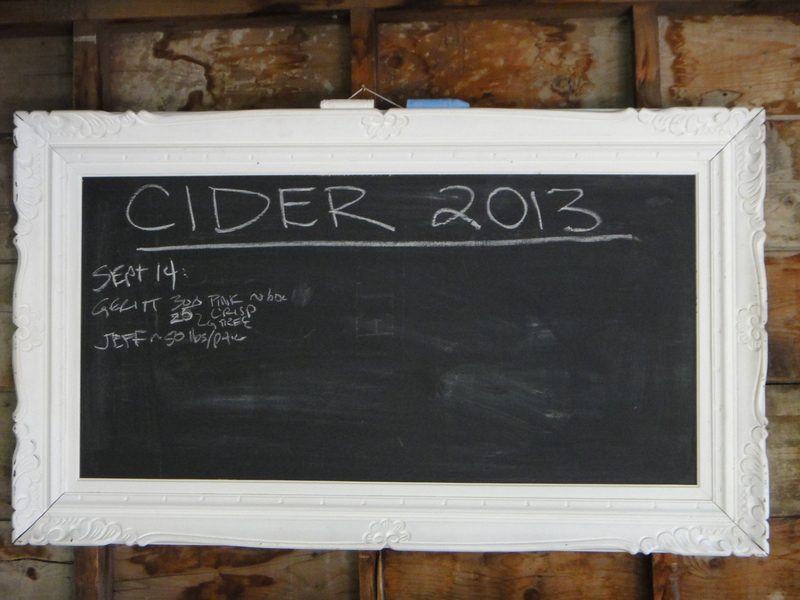 Once you enter the juice pressing domain, it is imperative to have a glass of cider in your hand. 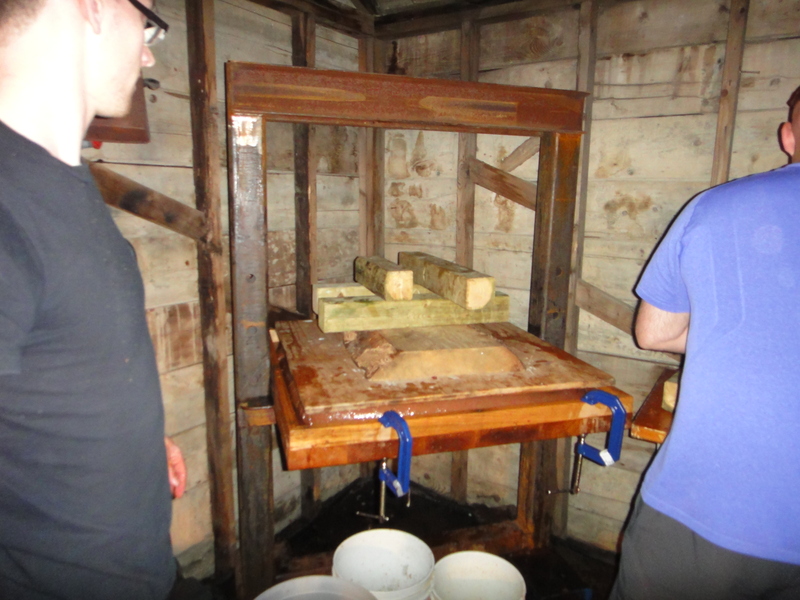 Justin and I arrived a little late in the queue to have our apples pressed, so we watched and got the feel for the whole operation. 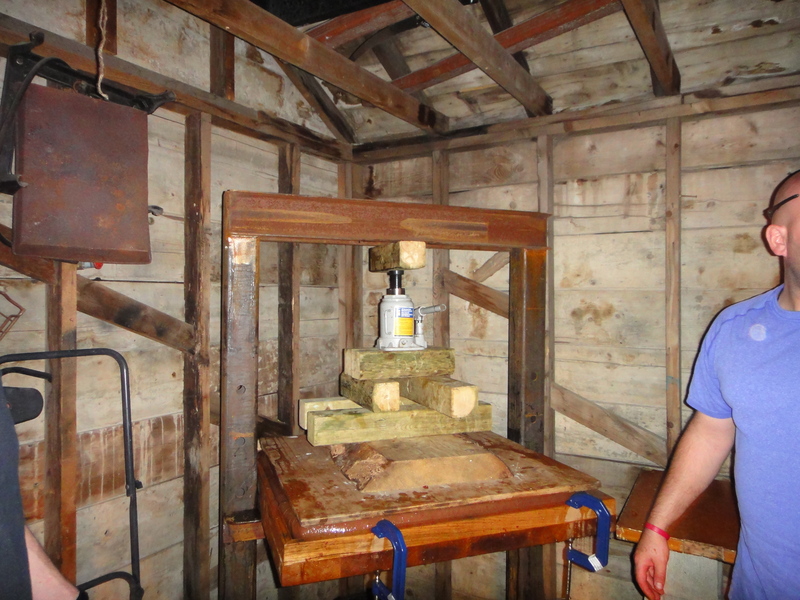 Here’s Jeff, pressing his fresh apple juice. 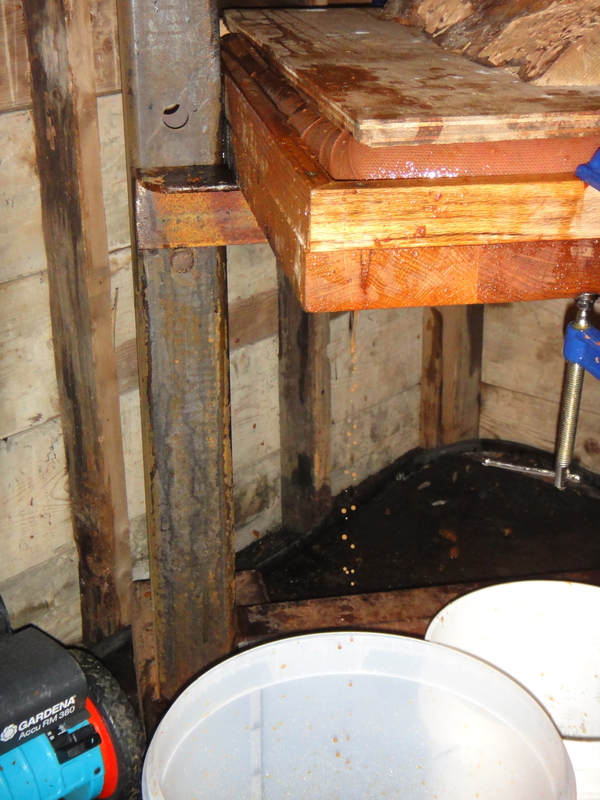 The whole operation flowed seamlessly. 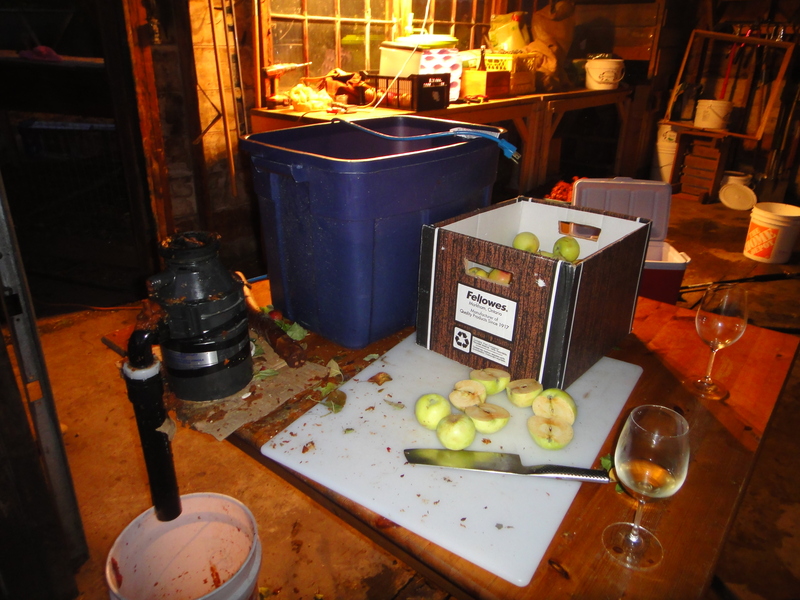 We also used quite unorthodox methods to break up an apple jam. Oh well – It worked! 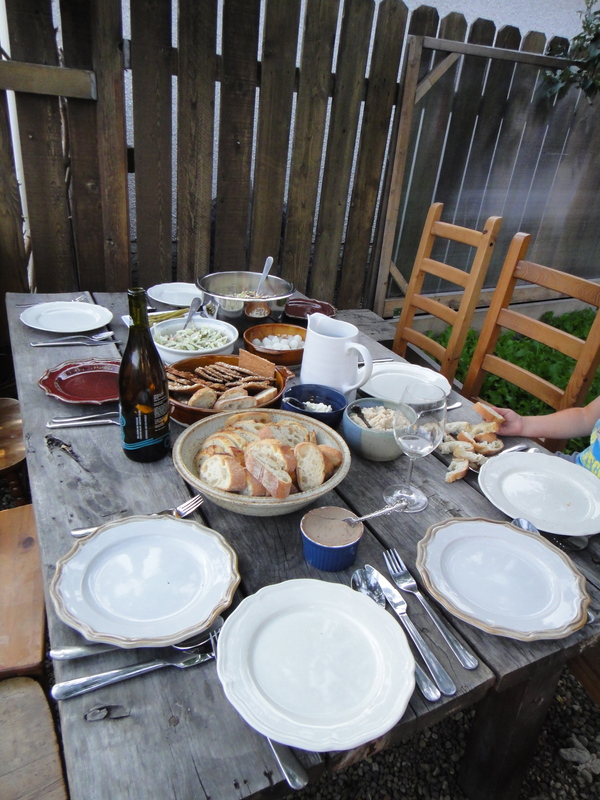 We took a break from apple juicing for dinner. Oh boy, was it ever good! 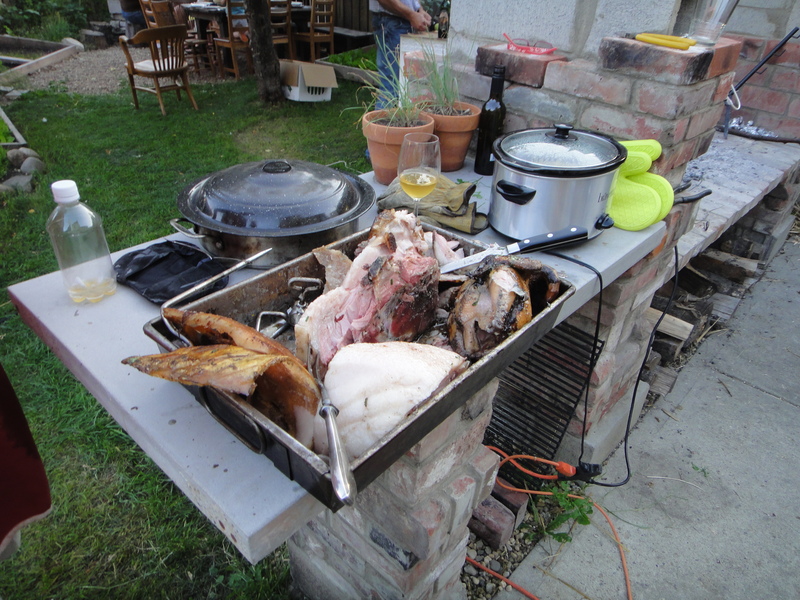 Slow, fire roasted chicken and pork from Nature’s Green Acres. 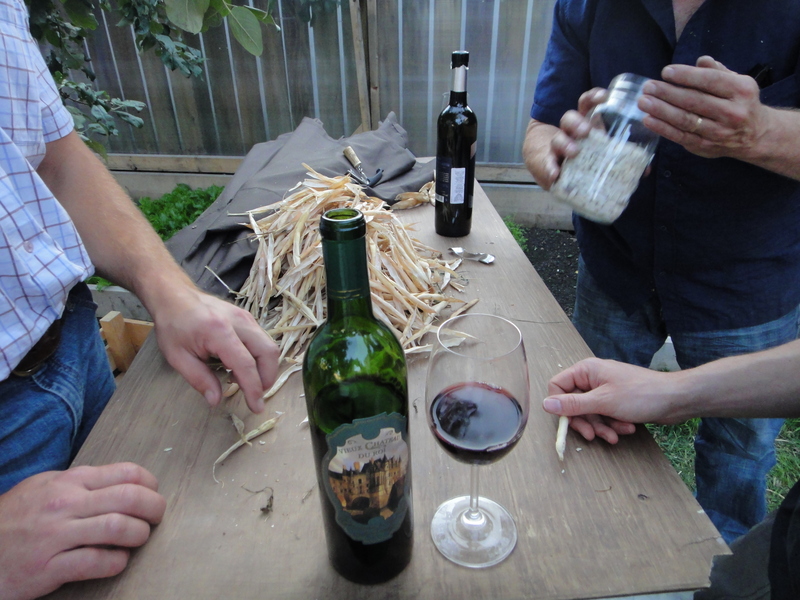 Shelling dried peas and drinking wine. What a fantastic evening! 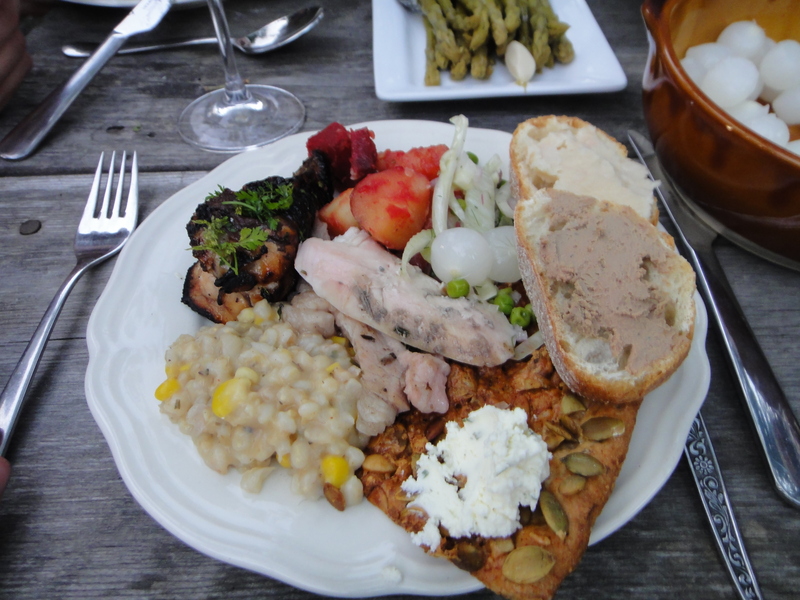 and the feast was on! This chicken liver mouse was to die for. It’s a Julia Child recipe! Stay tuned for a future recipe post! Oven roasted chicken wings. hmm…. Justin was now the master apple crusher. Our tasty crabs, ready for the crusher. 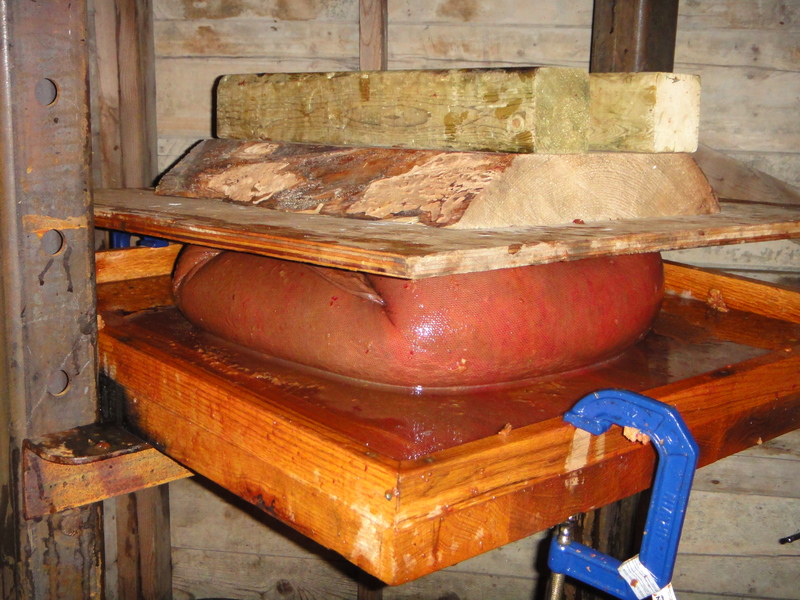 Here was our apple gunk, ready for the pressing. 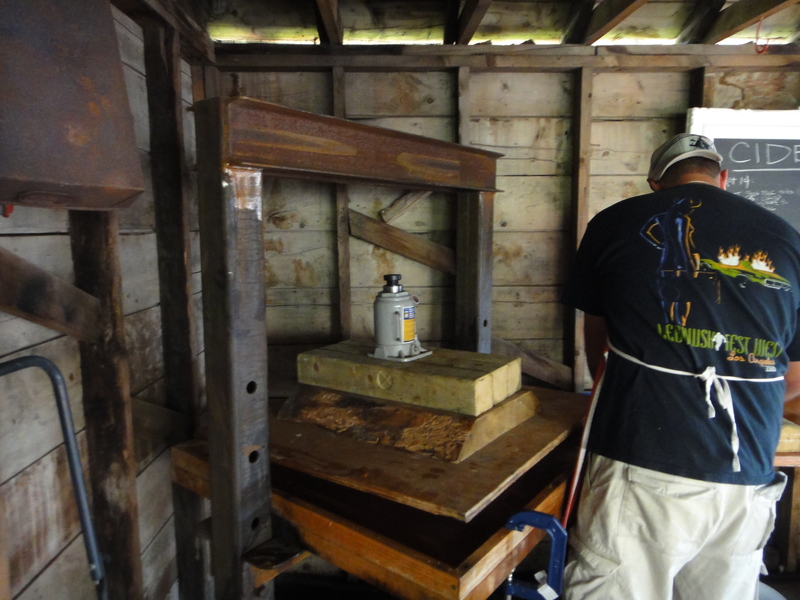 Jarret helped us out by showing us now the press worked. 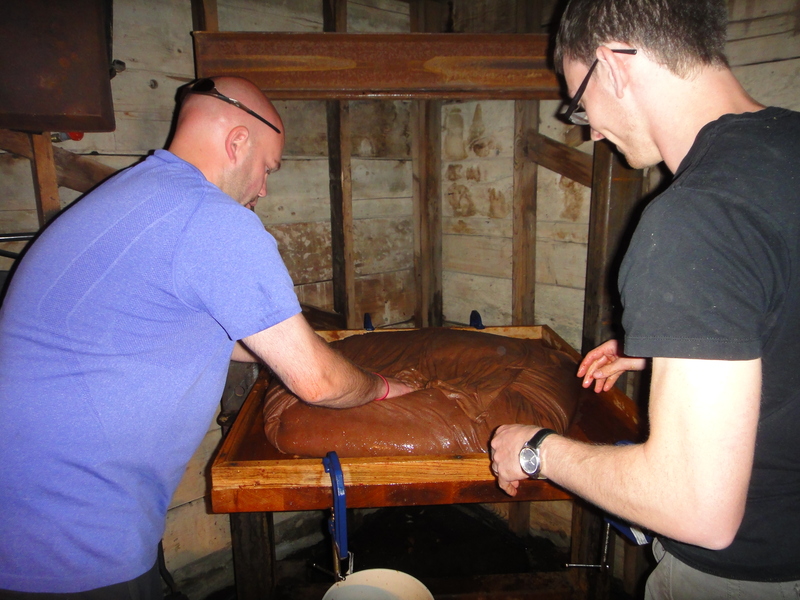 First, you envelop the gunk in a large, stretchy bed sheet. 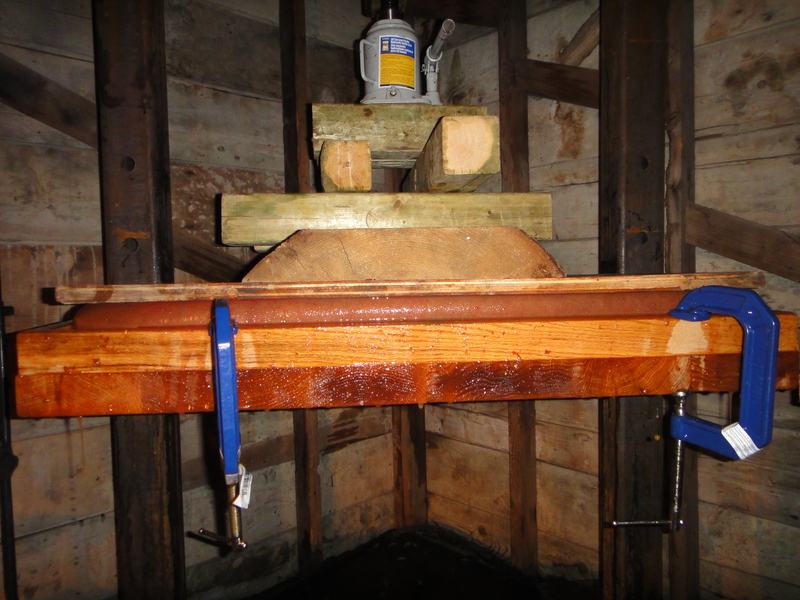 Next, you lay the top piece of plywood on top of the bed sheet. 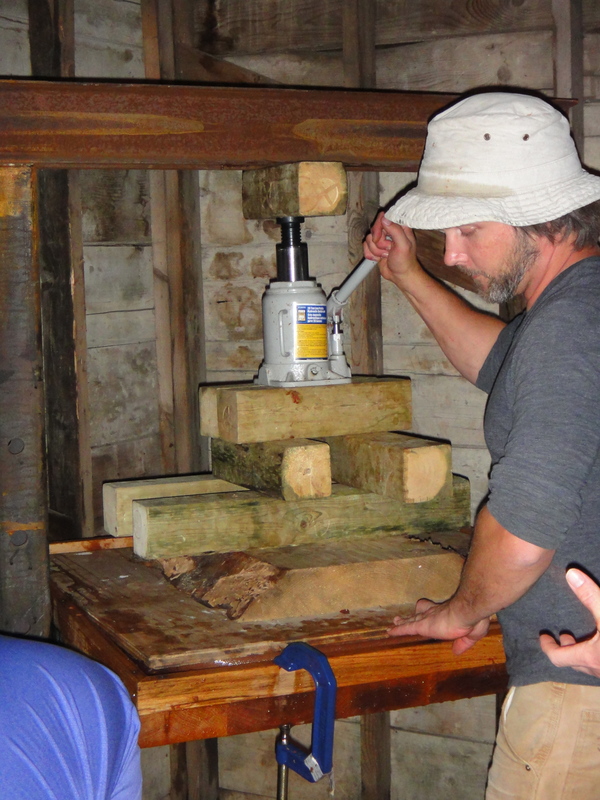 Then, you pile it high with 2x4s. 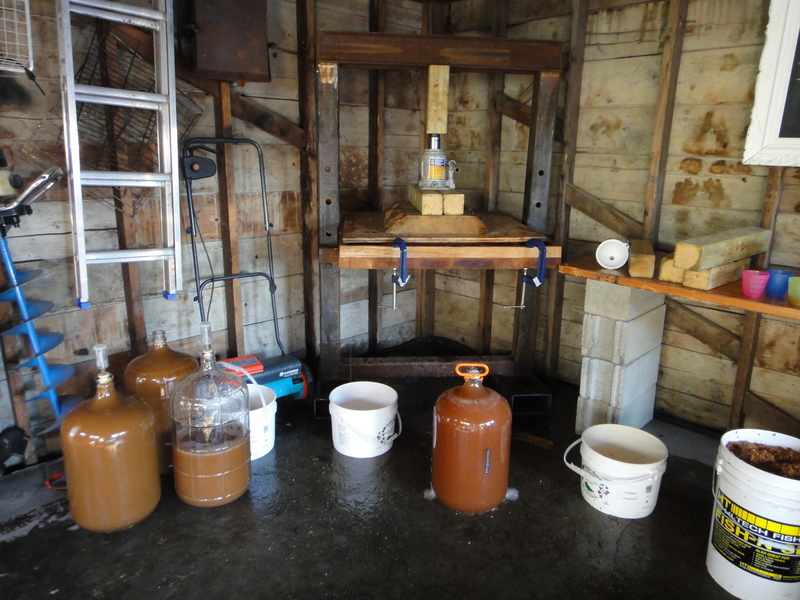 Our apple gunk was being a little finicky, so we had to just let it do its thing and wait. 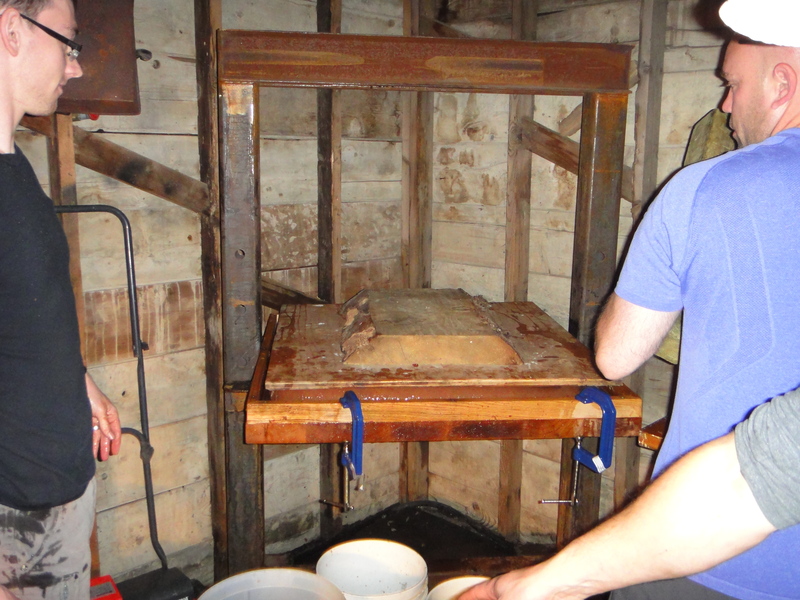 After a while, we folded the sheet over a second time, to get the juices flowing a little freer. 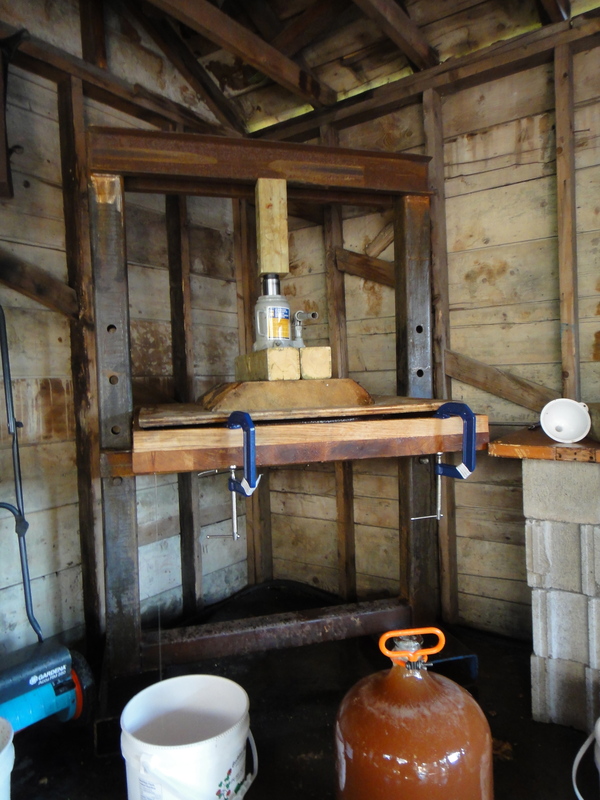 In the end, we got 20 liters of golden, delicious, fresh apple juice to take home with us. Thank you, Kevin, for the fantastic evening, for opening your home to us and sharing your knowledge. While I cannot tell you yet what we’ve decided to make with all the juice (it’s a surprise! ), know that it will be a fantastic adventure all on it’s own. I love cauliflower. It’s one of those veggies that is extremely unique to the taste and just looks plain cool. It comes in a variety of shapes and sizes (from white, to green, to even purple), and to top it all off, cauliflower is a cancer fighting agent! 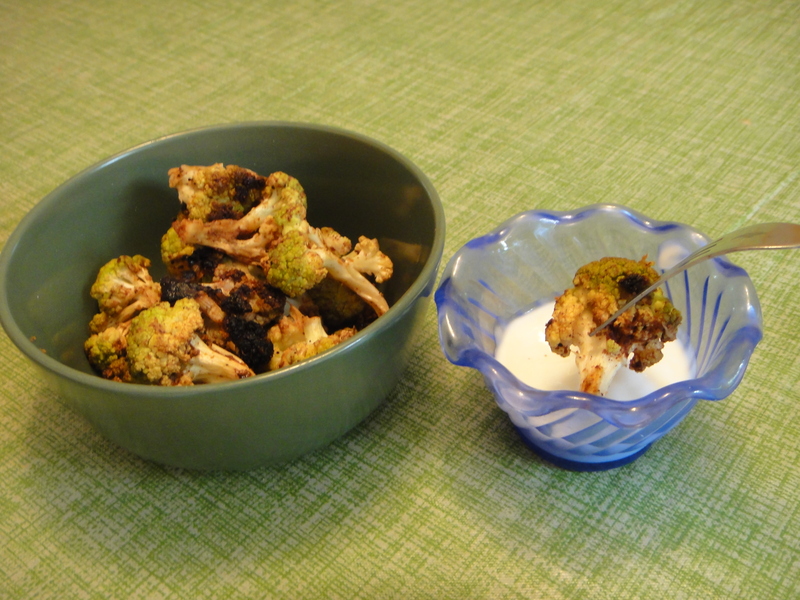 So, now that I’ve convinced you to eat your veggies, let me share with you a super tasty cauliflower recipe. I picked up this bad boy at Riverbend Gardens at the Strathcona Market. They were all the same price, so I opted for the largest one they had! I diced this beauty up into bite sized florets. 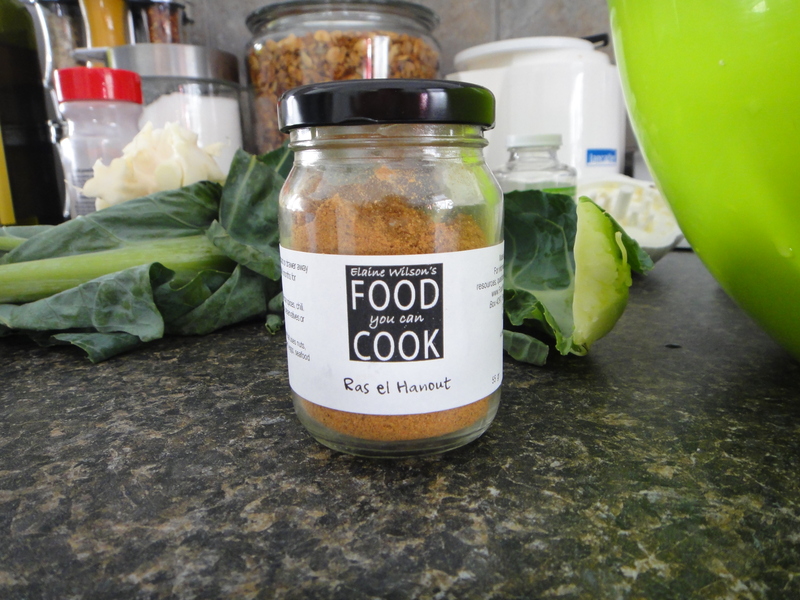 Now here’s the key to this recipe: Ras el Hanout spice blend from Food You Can Cook. This Moroccan spice blend is sweet on the nose and fiery hot on the tongue. It is smoky, savoury and all around intriguing. I highly recommend picking up one of these next time you’re at the French Quarter’s Farmer’s Market. It’s great to have on hand, anytime you want to add a little spice to your life. I used Mighty Trio’s Canola Oil to roast these puppies to perfection. 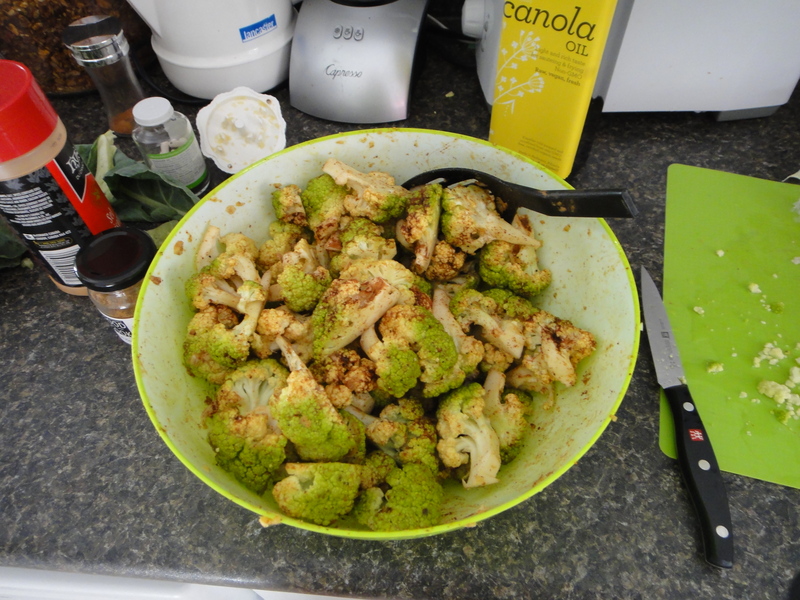 In addition to the Ras el Hanout, I added a little Cinnamon and seasoning salt, to give the cauliflower a little extra edge. Into the oven (or in my case, BBQ) they went! 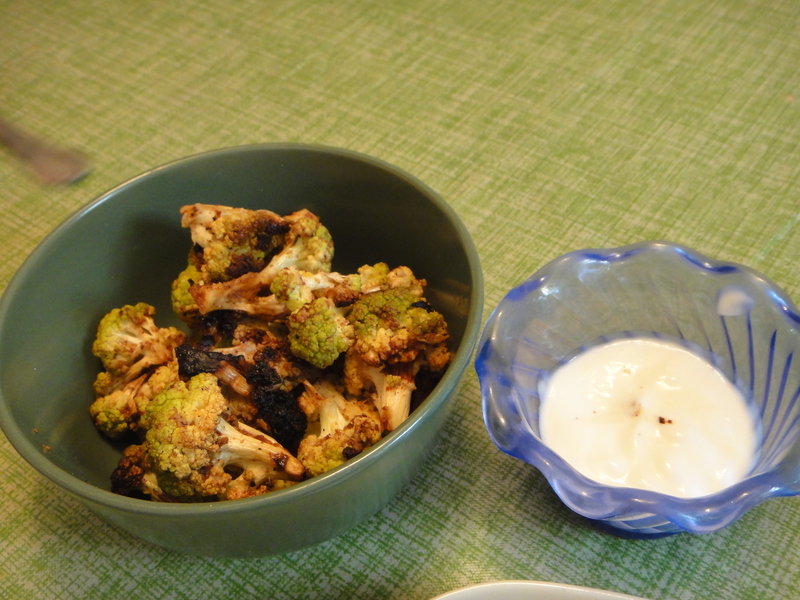 Once they are roasted to perfection, serve alongside a bowl of plain yogurt, for dipping. The yogurt definitely helps takes the edge off this spicy treat. If you can handle the heat, try it without. Your taste buds will welcome the adventure. Preheat oven to 375 or preheat BBQ on low. Wash and dice cauliflower into florets. 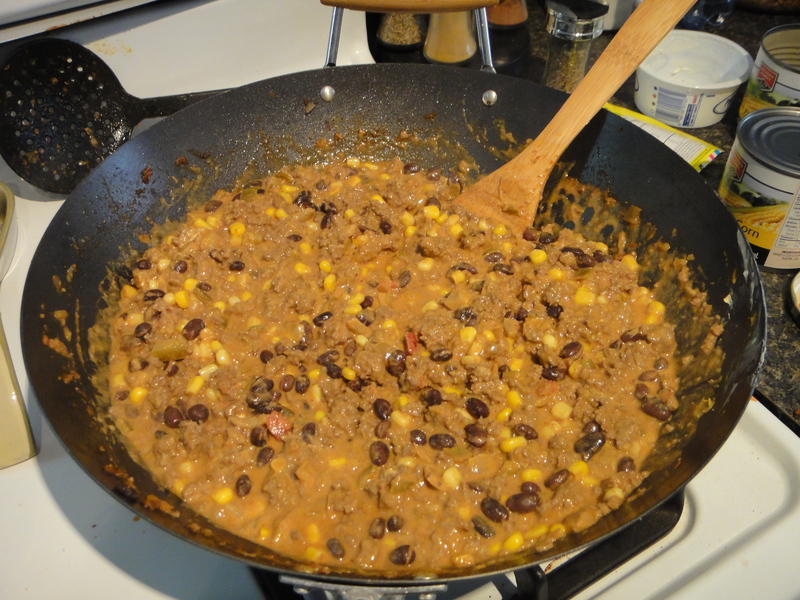 Add all other ingredients and toss to coat evenly. Throw into a baking dish and bake, if in oven, for 15-20 min, until florets are golden; if on BBQ, until edges begin to blacken a little. Serve immediately with a side of plain yogurt, to take the edge off. Enjoy, a lot! 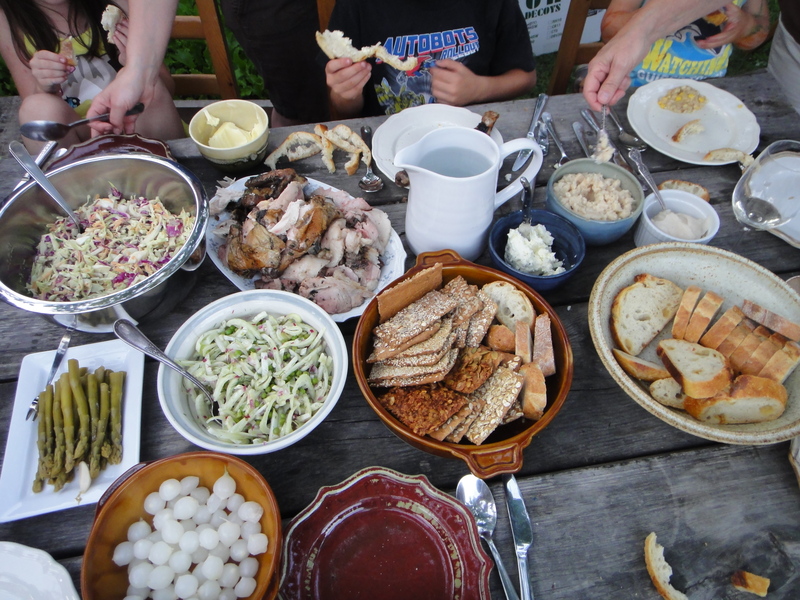 I’ve had an excellent summer of new food discoveries. One of them being that Elaine Wilson of Food You Can Cook had created a plethora of new sauces and spices for my culinary adventures. I made this discovery while perusing the booths at the French Quarter’s Farmer’s Market one Sunday afternoon. Well, of course I got a little excited and got a whole bunch of new sauces and spice mixes to try. 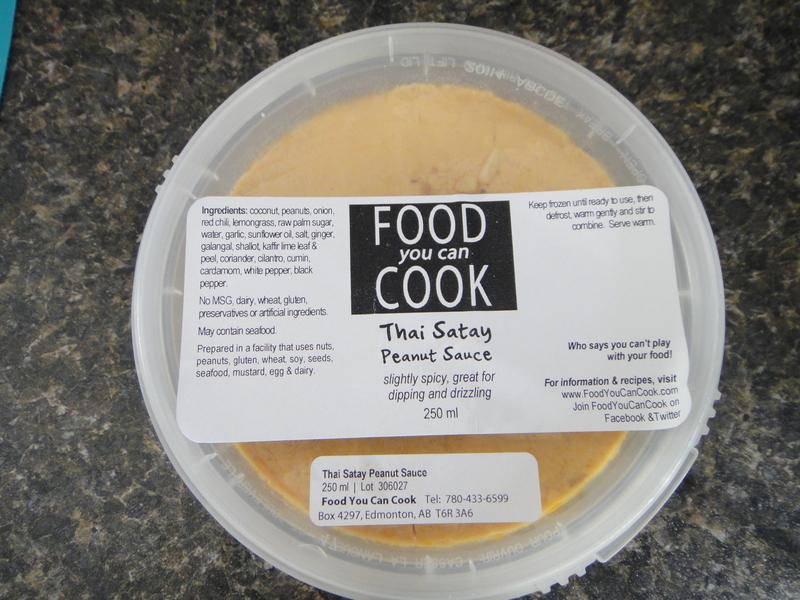 Elaine’s Thai Satay Peanut Sauce was heavenly. Sweet, spice and nutty. It was a great base for a stir fry. 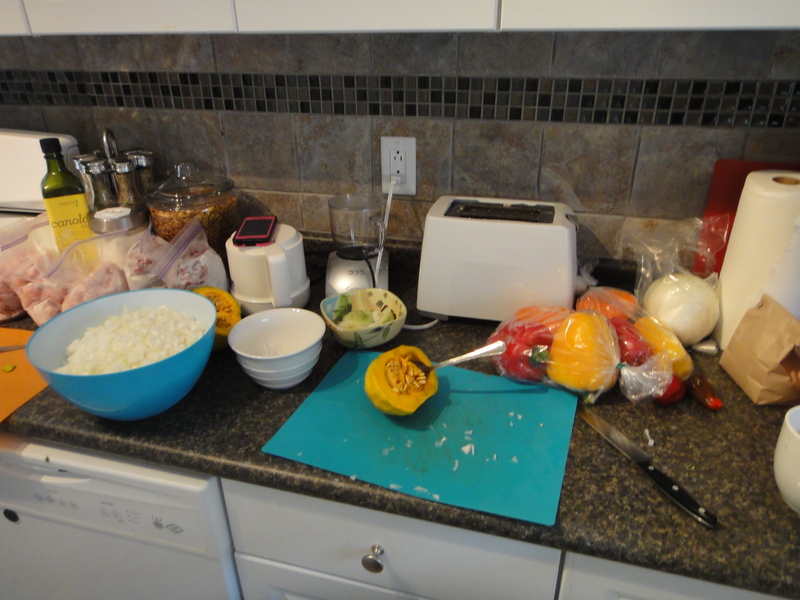 I chopped up some veggies (peppers, onions and yellow zucchini). 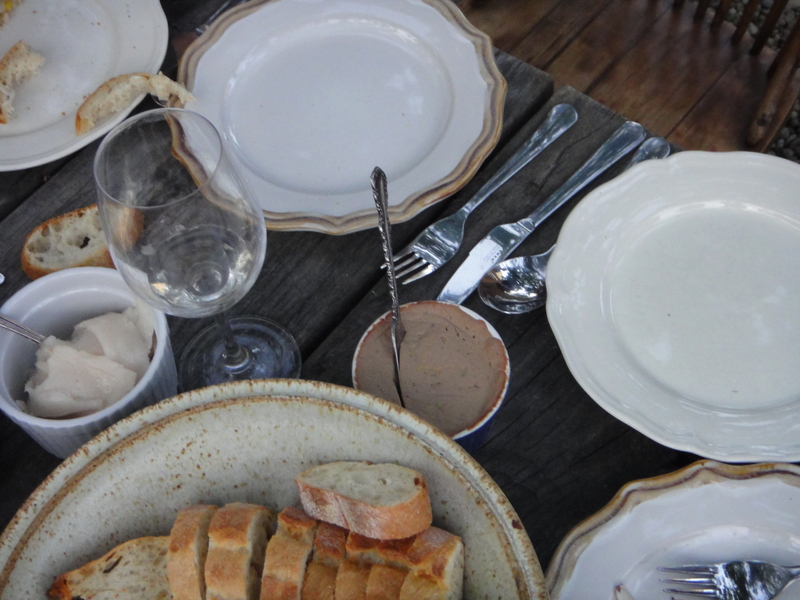 I served the tasty mix on a bed of Jasmine rice, for a Thai feast fit for foodie adventurer. If you have any leftovers, it makes for a great topping for a flat bread pizza. Just add a little bit of smoked cheese on top, and broil on high for 5 mins and voila! Tasty Chicken Peanut Satay Pizza. Begin cooking rice according to package instructions. Chop chicken into bite sized pieces and brown in a saucepan. Dice veggies and add to chicken. 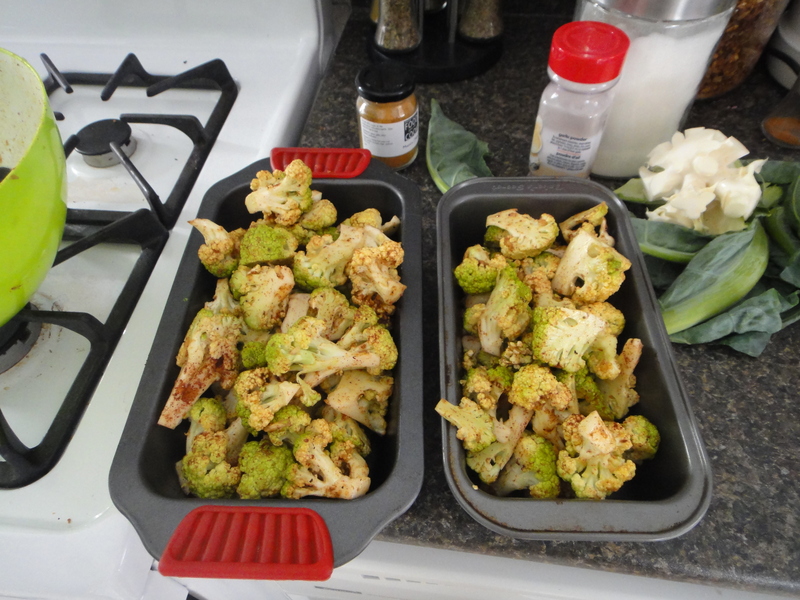 Once veggies are cooked almost all the way (cooked, but still a little crunchy), add sauce. Heat till warm. Serve on top of rice. If you have leftovers, pile on top of a flat bread, top with cheese and broil for 5 min on high in the oven. Enjoy. A lot! Sometimes you just need meals that are super easy to assemble to have on hand at a moment’s notice. This happened recently in my family, when my mom went in for hip replacement surgery. My little sister, who is running her own business and acting as my mom’s primary caregiver during her recovery, put me and my sisters on food duty. Because I find myself having limited time lately, I crafted some very simple meals that could be frozen and popped in the oven whenever she needed them. This rock awesome taco pie was one of them. I stopped by Save-on-Foods to grab some of the ingredients I needed and picked up a 1kg of lean Alberta ground beef for 12 bucks. Score! 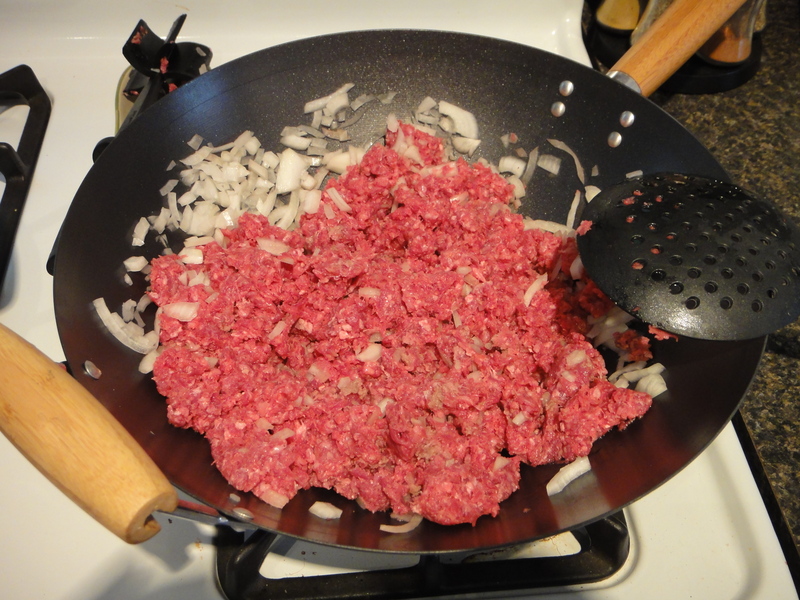 I chopped up some onions and browned the ground beef in together, for a great base of flavours. I made sure it was fully cooked before moving on to the next step. 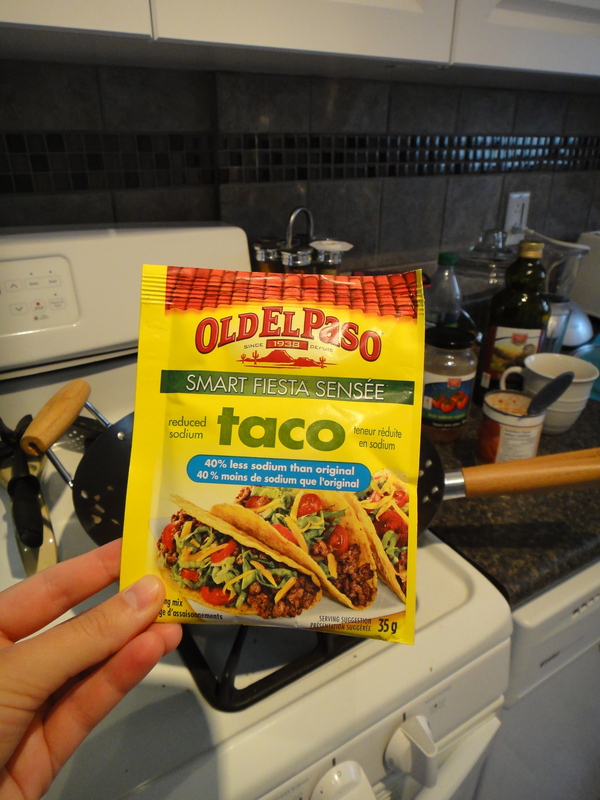 For the seasoning, I used a good old package of Old El Paso taco mix. Ok, Ok. I know. It’s no local and fantastic spice mix from Elaine Wilson’s food you can cook, but sometimes, you just need to use what is on hand for convenience. This is definitely one of those times. I followed the package instructions and let it simmer until the seasoning was well combined. 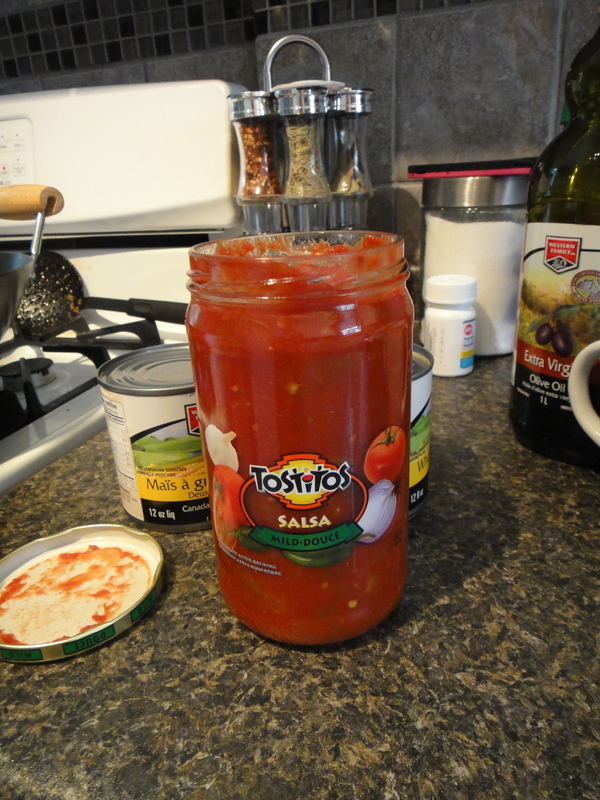 Next, I cracked open an extra large jar of salsa. 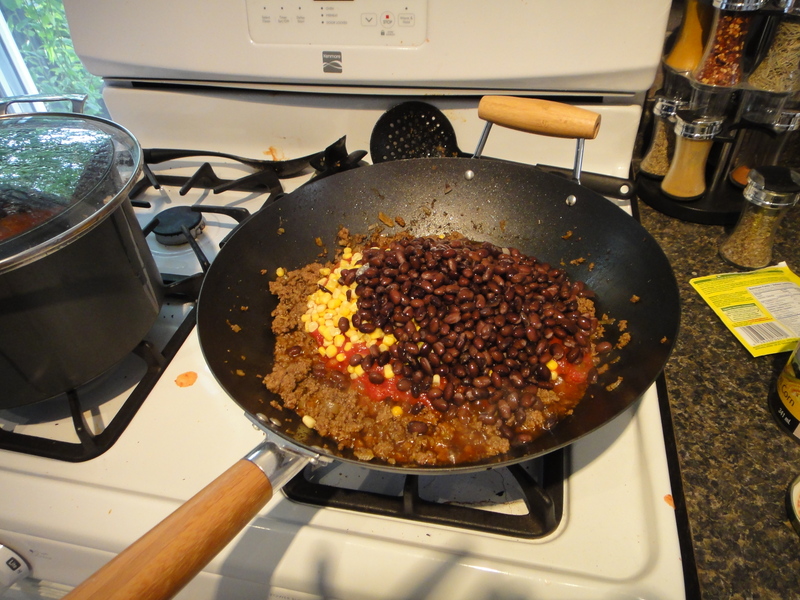 Then I added a can of black beans, corn and the salsa to the beef. 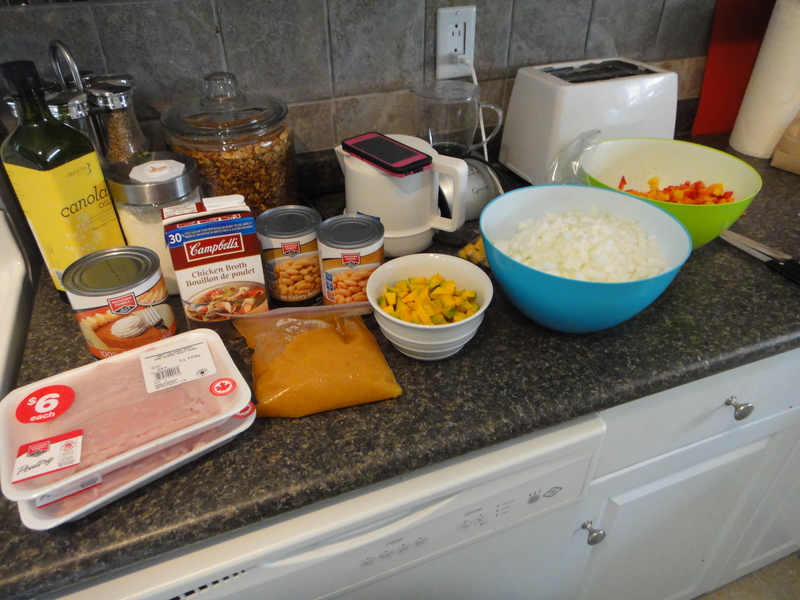 Next step was to mix it all together. 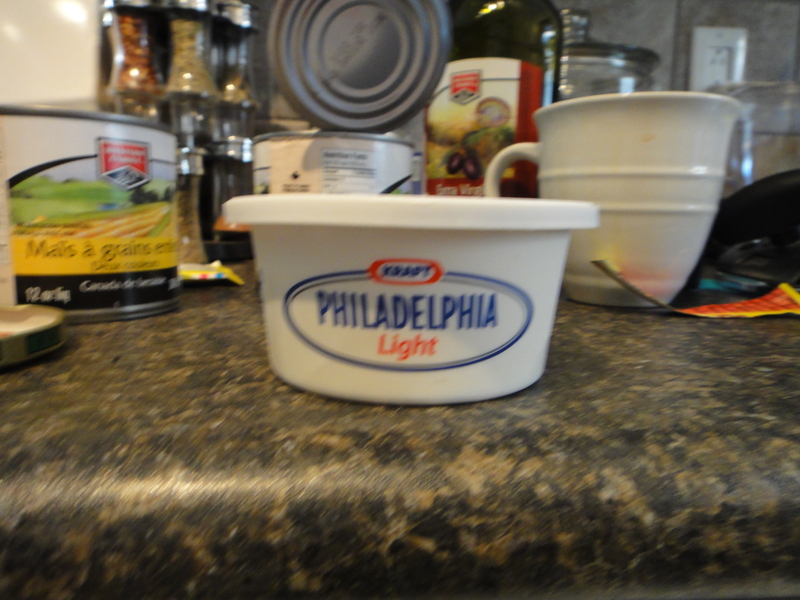 Now for the fun part – cream cheese, to make it smooth and delicious. I melted the cheese into the mix and made sure it was fully incorporated. Assembly time! 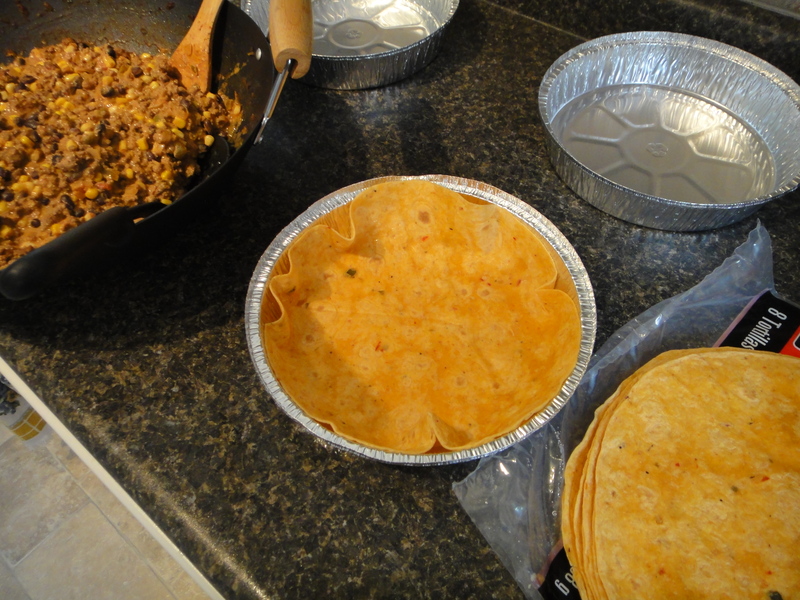 I bought deep dish pie tins and large tortillas to assemble the pie. I started with one tortilla to line the bottom. Then added one layer of the beef mixture. 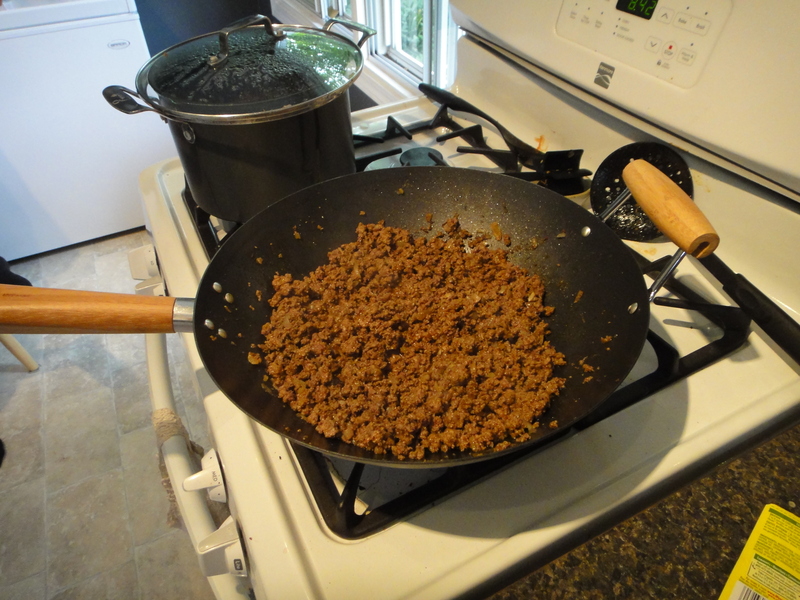 Then topped the beef mix with cheese. 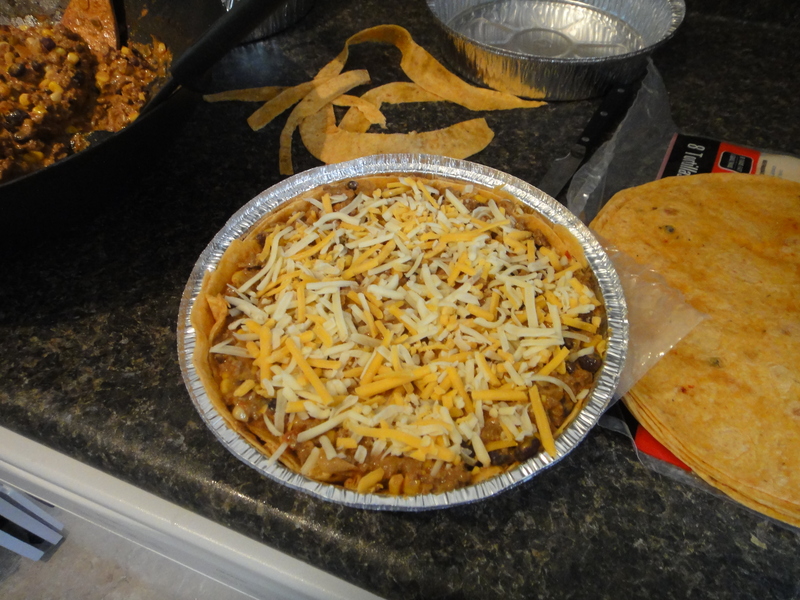 Do three layers of tortillas, meat and cheese, leaving a nice layer of cheese on the top of the pie. 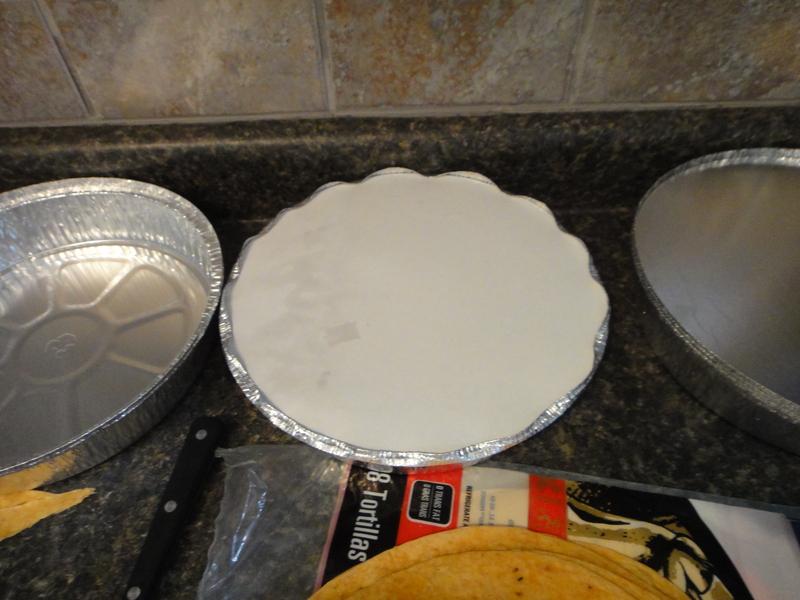 I cover the pie with an oven-proof lid, then it’s all ready to go for the freezer. 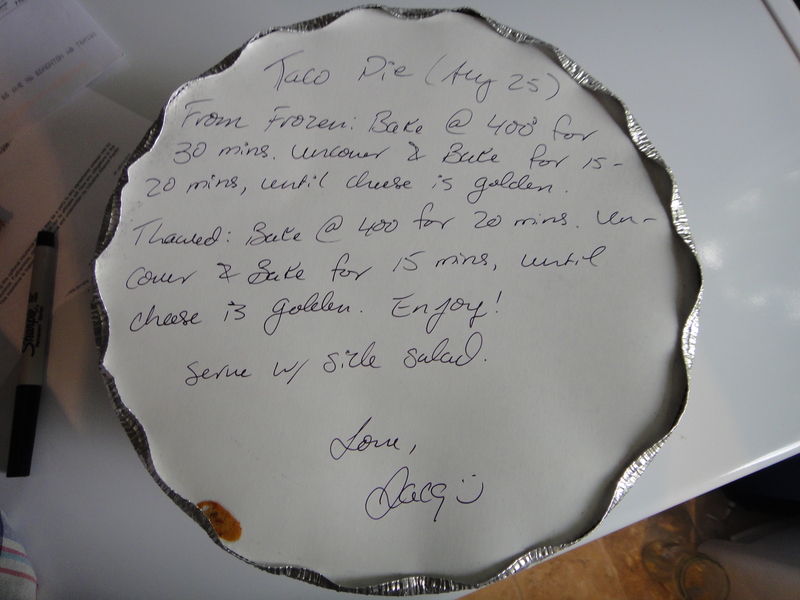 Pop the instructions onto the top of the of the pie for your wonderful mom during her recovery. 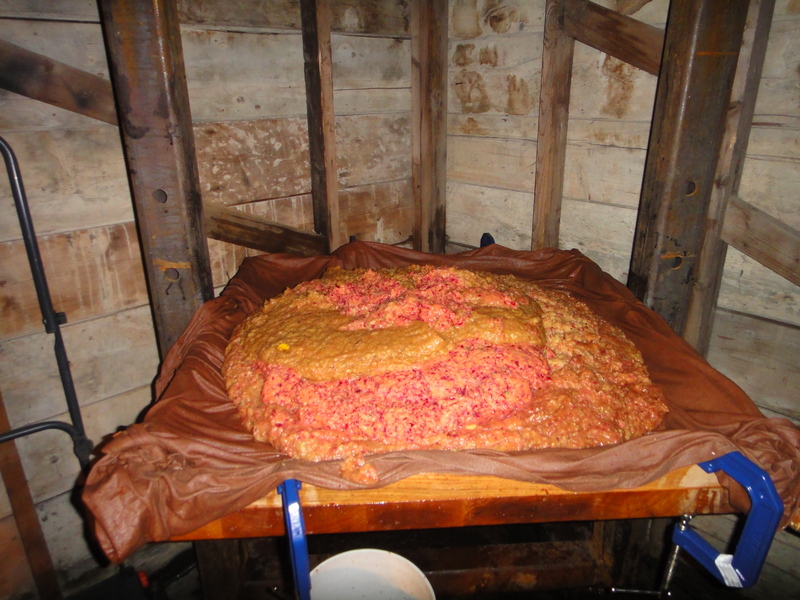 Dice onion and ground together with beef until fully cooked. Add taco seasoning and follow packages instructions. 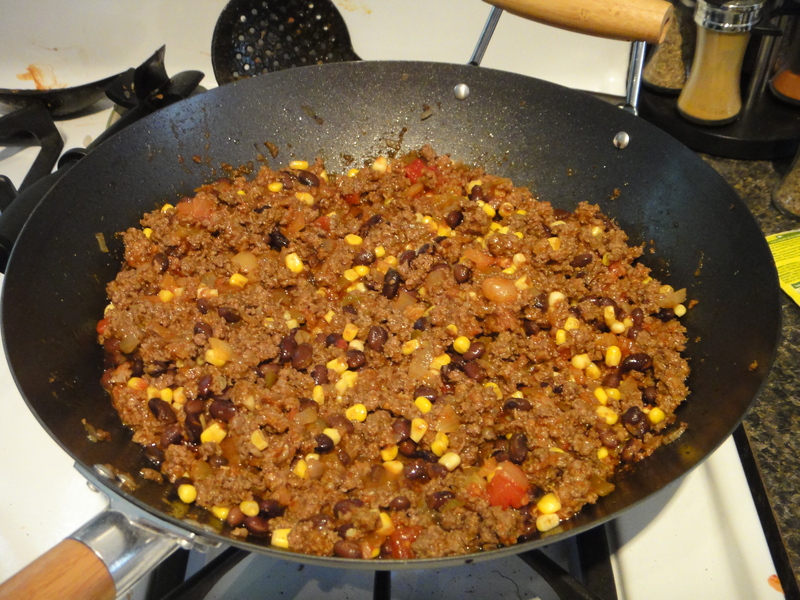 Once seasoning is fully incorporated, drain cans of corn and beans and add to beef. Add salsa to beef. Mix well. Add cream cheese and let melt for 2-3 mins in the beef mixture before mixing well to combine. 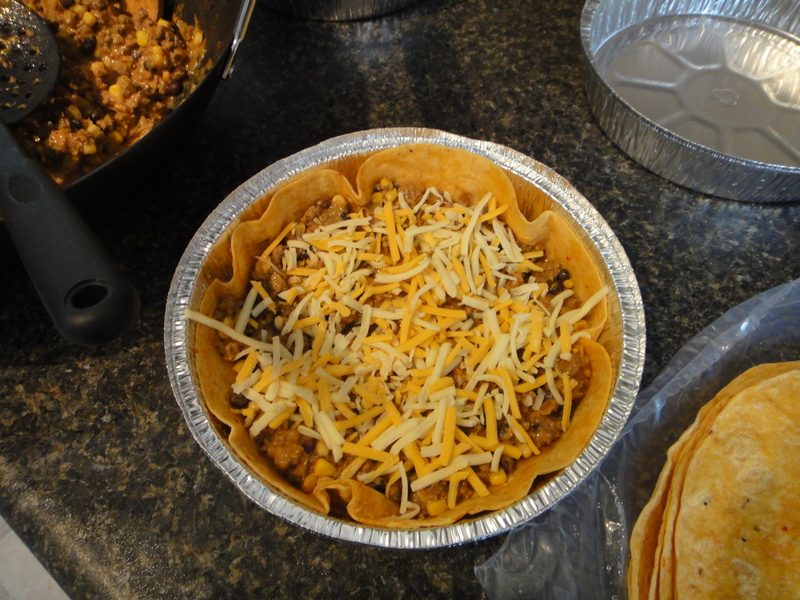 To assemble the taco pie, line deep dish pie shell with tortilla. 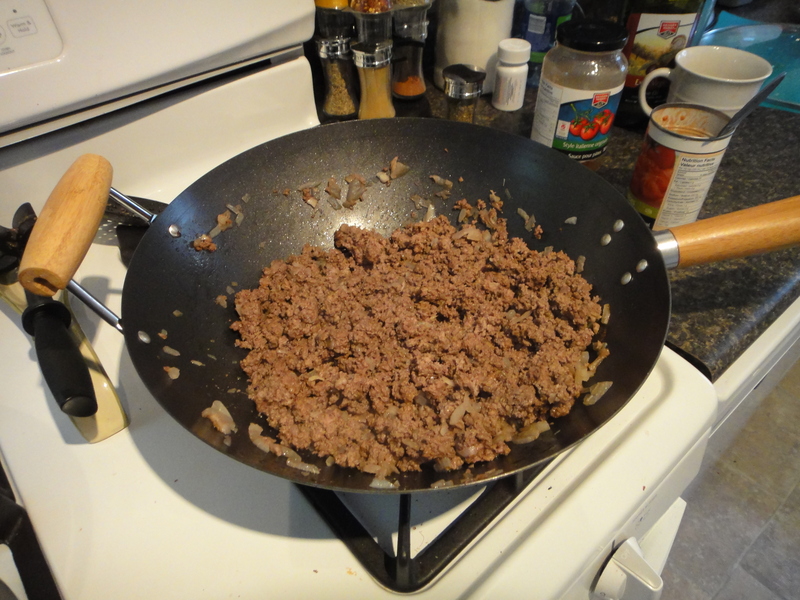 Add a layer of the beef mixture. Top with cheese. Repeat layers 3 times finishing with cheese. 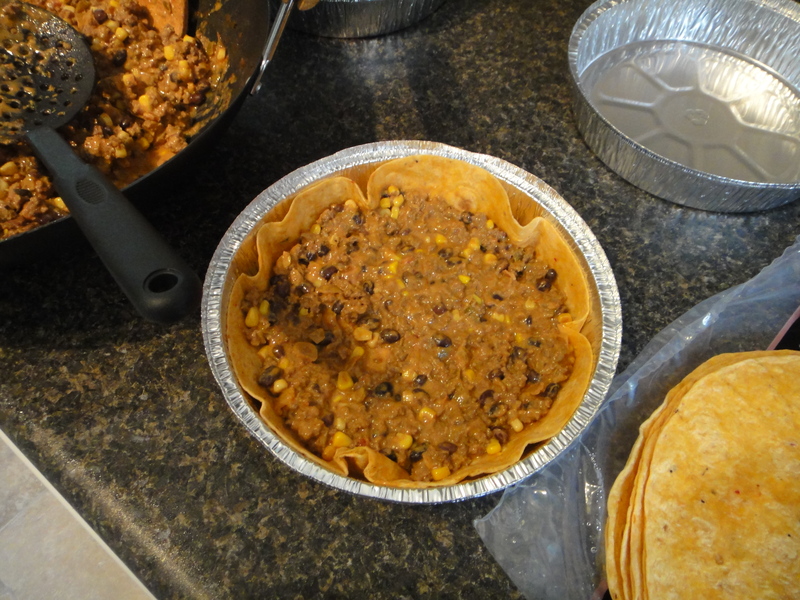 You can freeze the taco pie for up to 3-4 months. Or, if you want, pop it in the oven, covered, at 400 for 20 mins, then uncover for another 15. Serve with a side salad and enjoy, a lot! Back in June, I was invited to take part in an awesome event. Gemma from Dishcrawl had sent me an email inviting me to come and blog about a dishcrawling experience through Southgate. I was even going to receive a free ticket in exchange for a blog post. How sweet is that? I was so for it. Unfortunately, my schooling had other plans. I had to miss out on this awesome opportunity, much to my annoyance. Now, being done school and in a stable job, I am able to attend events on the weekend at my leisure. I emailed Gemma right away and signed up for Neighbourfood. First stop, the Manor. Beautiful! While I have been there before with my family, I liked it so much I thought I’d give it another go. They served a duck sausage with caramelized onions on a crostini. It was surprisingly… ok. The sausage was rather salty, although I liked the texture (it had no casing), but the onions and other condiments were nothing to write home about. The portion was really small, so Justin and I were still pretty famished, so we moved on to our next location right away. Next stop, Violino’s Gastronomia. We stopped in because a friend, in passing, had mentioned that their food was the best on the crawl thus far. Well, now I had to check it out. Wowza. Incredible! 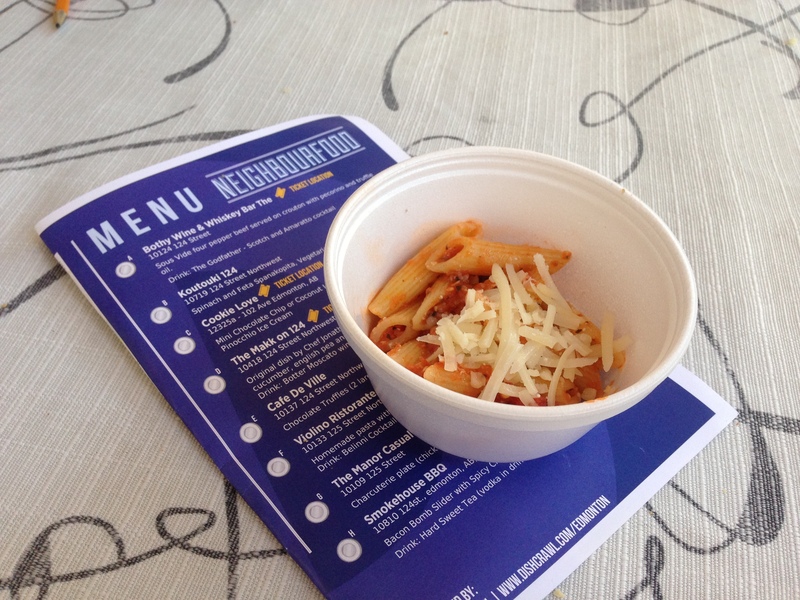 They served wood fire pizza (on the only outdoor wood fire oven in the city), and pasta with tasty Italian sausage. The pizza had ground chicken, pistachios and a sweet sauce. I have never had such a unique combination on a pizza before. This one won my dishcrawling experience. It was incredible! The pasta was very good too. Fresh pieces of Italian sauces mixed in with a luscious pasta sauce. Loved it! They served peppered steak and salad. It was also ok. Nothing too special. I say that, yet we eat every bite. I guessed we liked it. Or we were just really hungry. We got in there, and man, was it ever cute! Milk bottle chandelier, awesome cow paraphernalia. We were quite enamored by the decor. They even provided mini root beer floats while we were waiting for our sandwiches. Nice touch, cookie love, nice touch. The float was darn tasty, too! Then out comes the sandwich. Or should I say baby sandwich? Yep. I am not exaggerating. It was that small. Justin ate his in one bite and I tried to savour mine, but I even managed to finish mine in two. For 5 dollars, you could have purchased one of their regular sized ice cream sandwiches (Think DQ sized- so normal sized). Justin and I were seriously bummed, because ice cream cookie sandwiches are one of our favourite treats. Overall, we had a decent time. It was quite the unique experience to be able crawl from restaurant to restaurant in a community; however, the portion sizes provided at the restaurants were much too small for what you are paying for the ticket price. It breaks down like this: You buy a general admission for 15 dollars. Ours were generously donated by to us by dishcrawl in exchange for a post. We were super thankful to them for that. Then, you can purchase tickets according to how much you’d like to enjoy throughout the crawl. The more tickets you buy in advance, the more you save. (We only purchased 7 tickets, because we didn’t want to get too full. We also had no idea what to expect in terms of portion sizes…) To be honest, I had expected the portions to be similar to Taste of Edmonton, but they were much, much smaller. It might have been better if we initially bought more tickets in bulk, but having to pay 5 dollars at the end for one tiny ice cream sandwich really busted our chomps. It doesn’t help that that was the last experience we had, so it left a little bit of a sour taste in our mouths, and an empty feeling in our bellies. Overall, I wouldn’t dishcrawl around a neighbourfood again, but I would like to try a regular dishcrawl, where patrons are greeted with regular portion sizes that fill their bellies. It was a very unique experience and I applaud Dishcrawl for organizing such a well run and unique event.